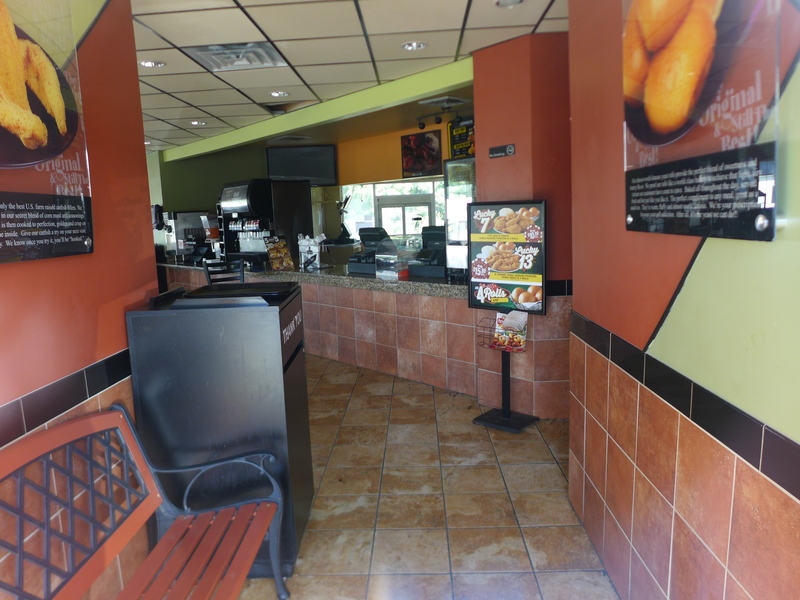 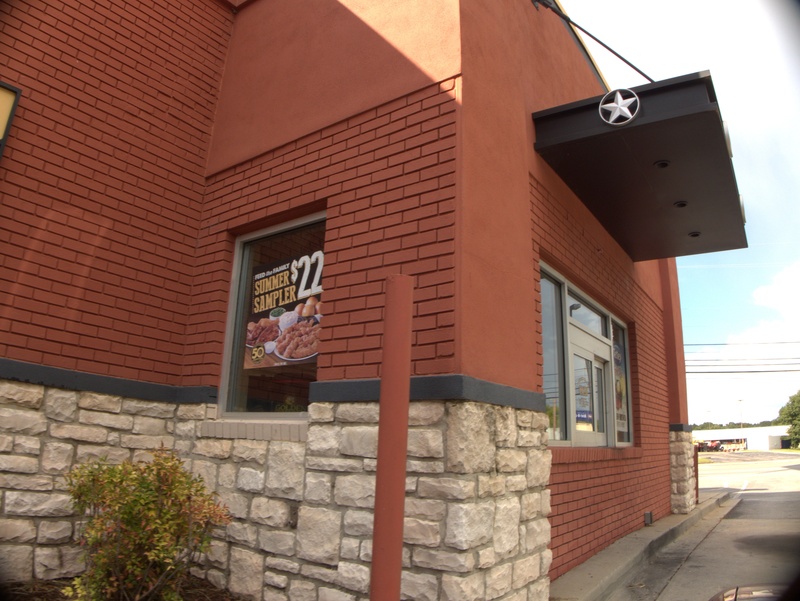 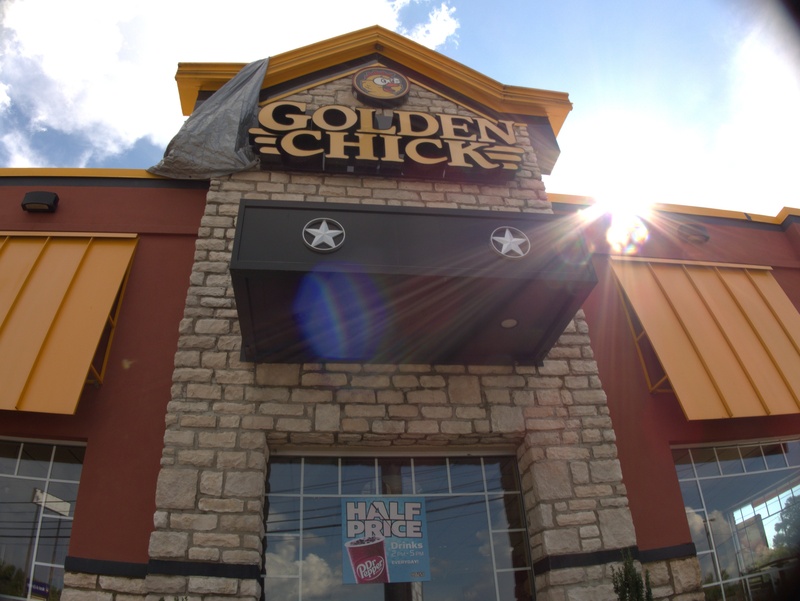 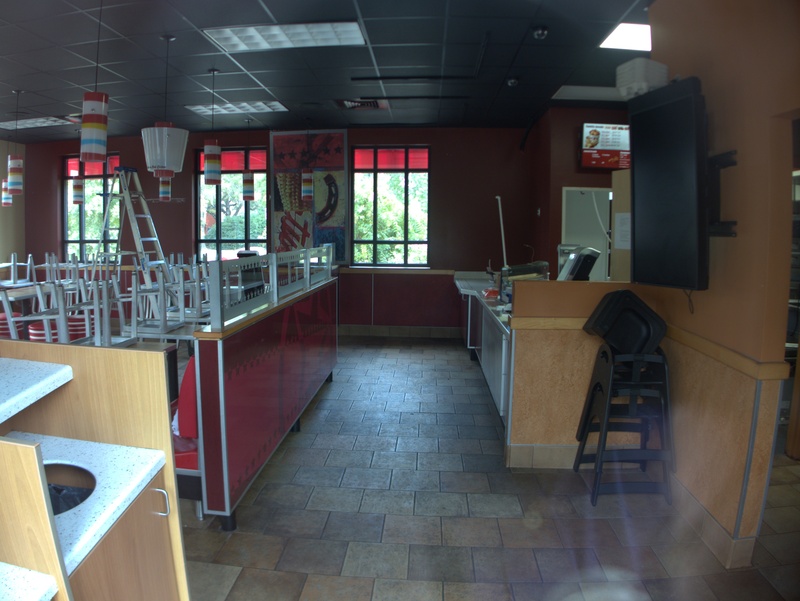 Golden Chick was the follow-on to Wendy's in this (extensively remodeled) spot. 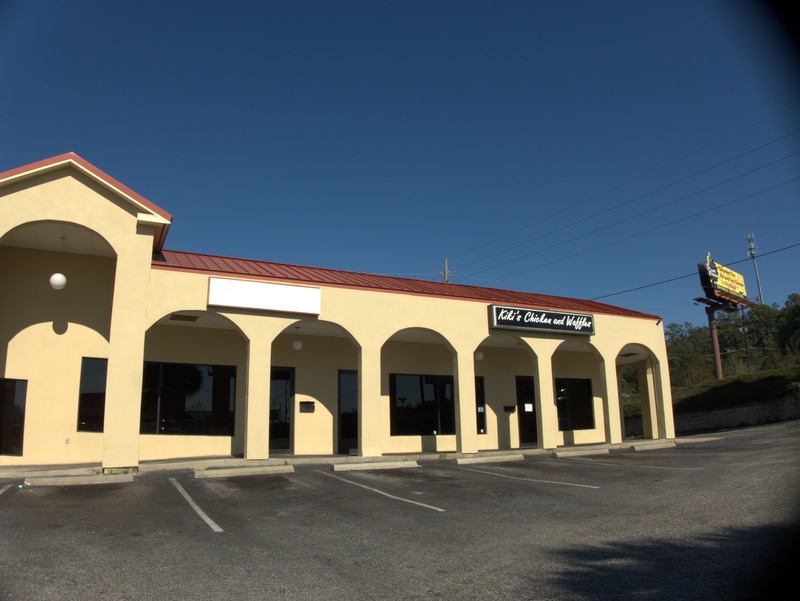 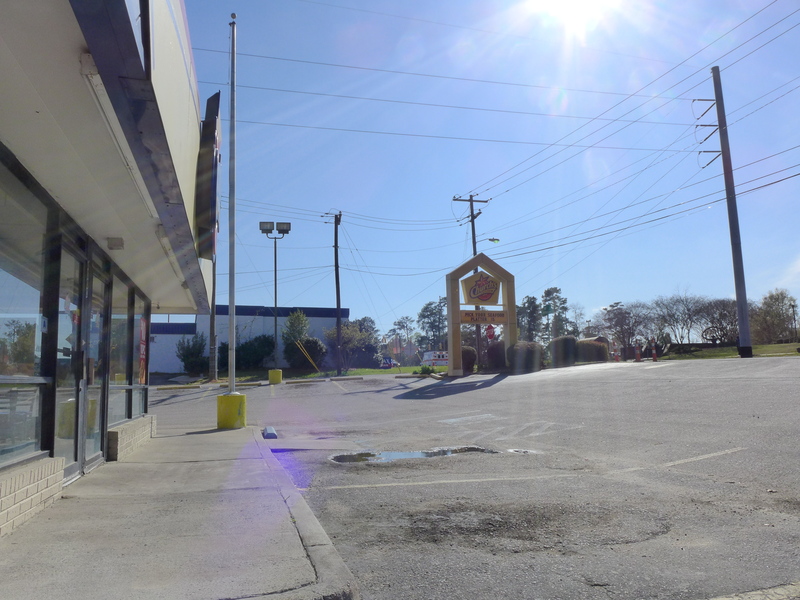 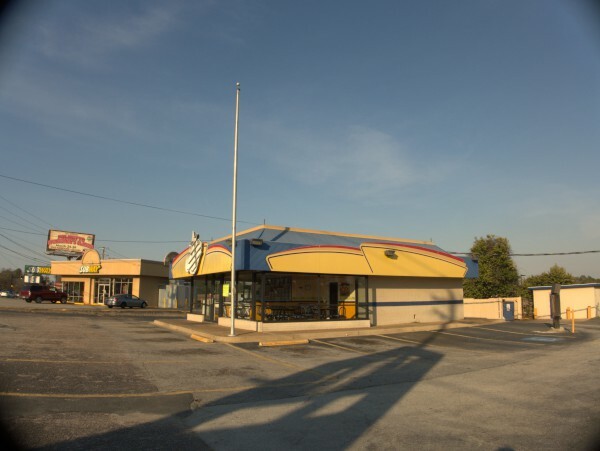 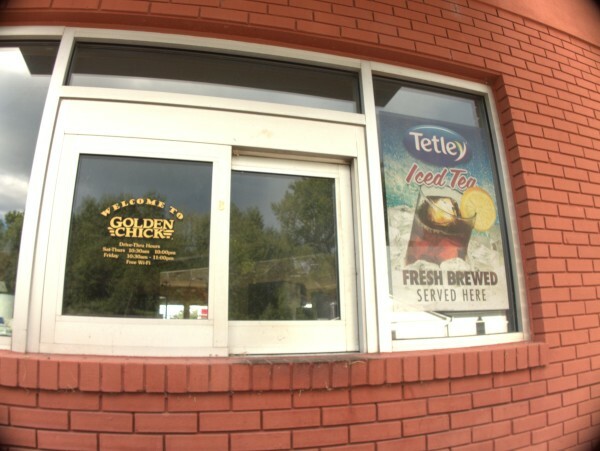 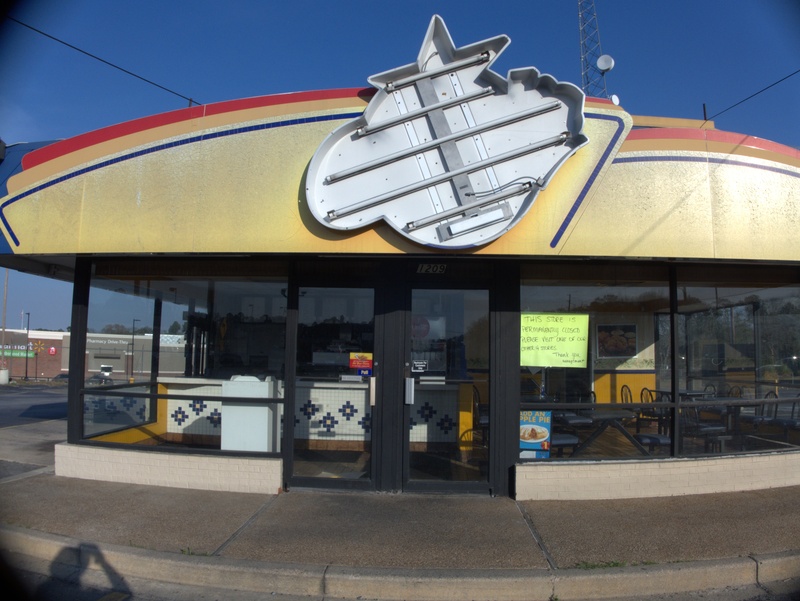 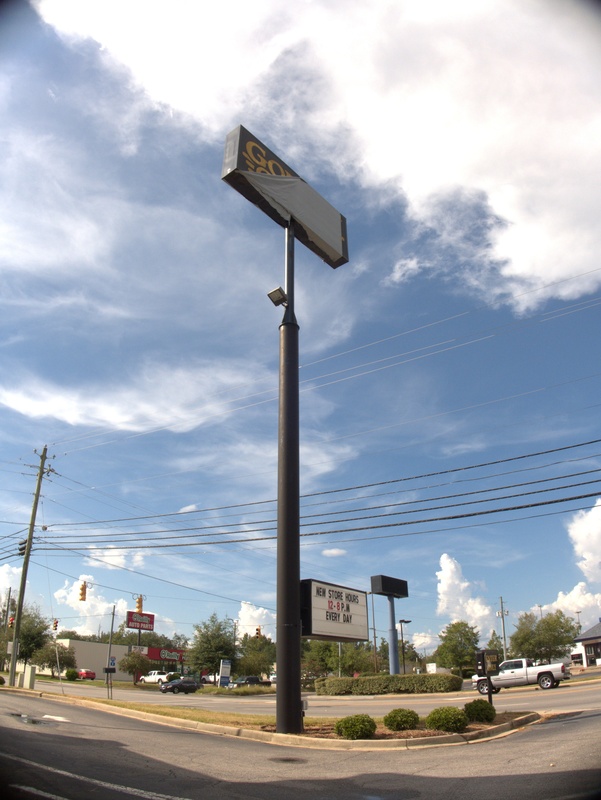 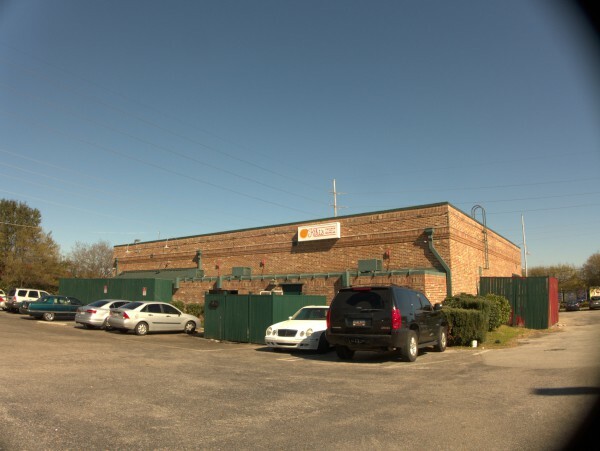 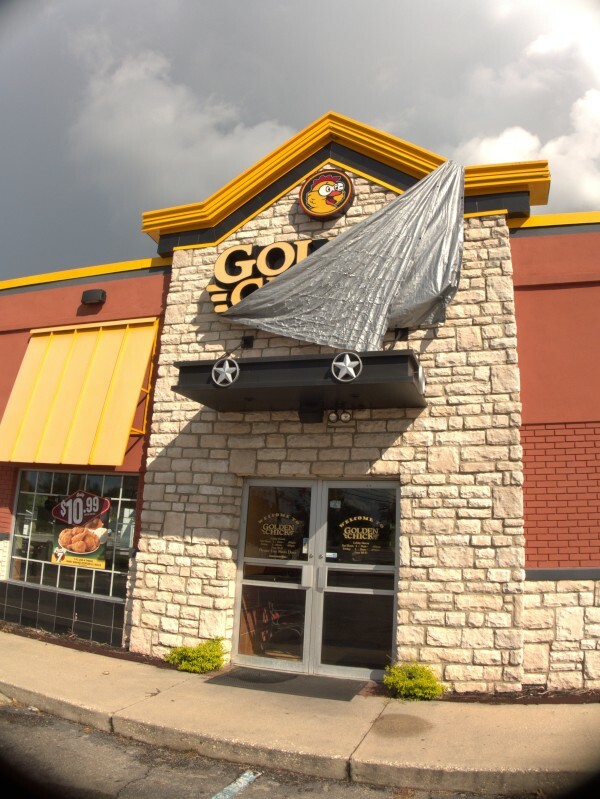 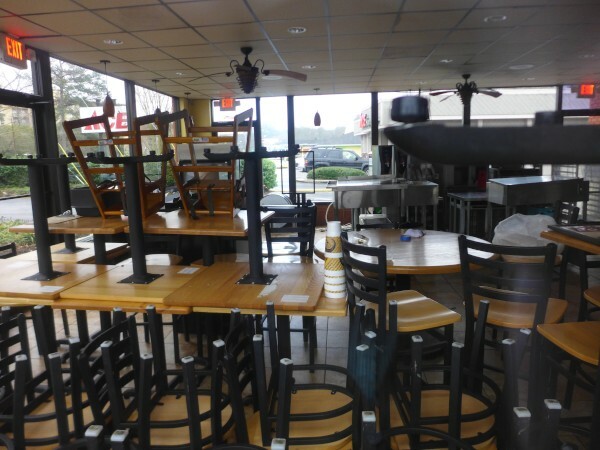 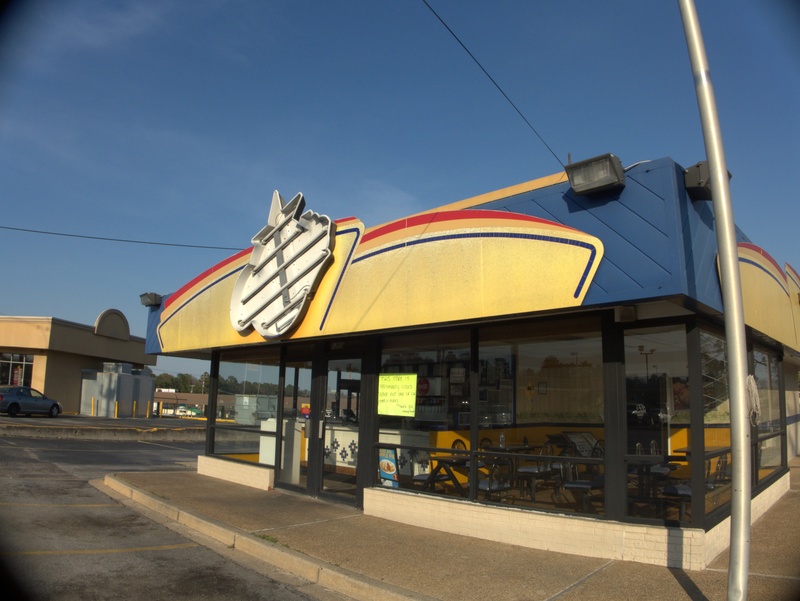 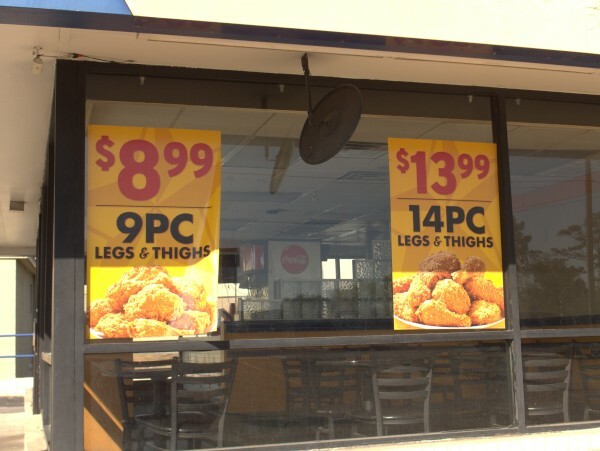 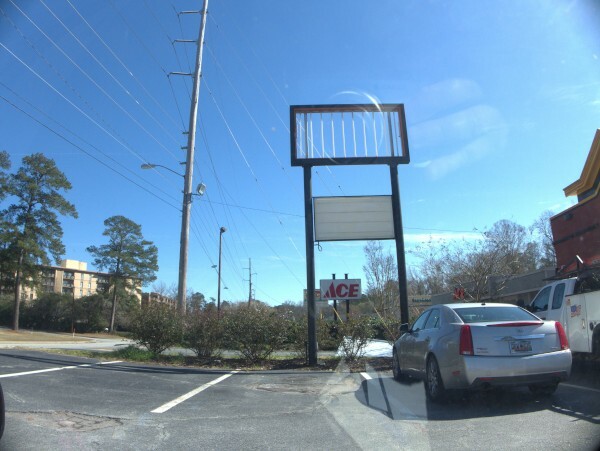 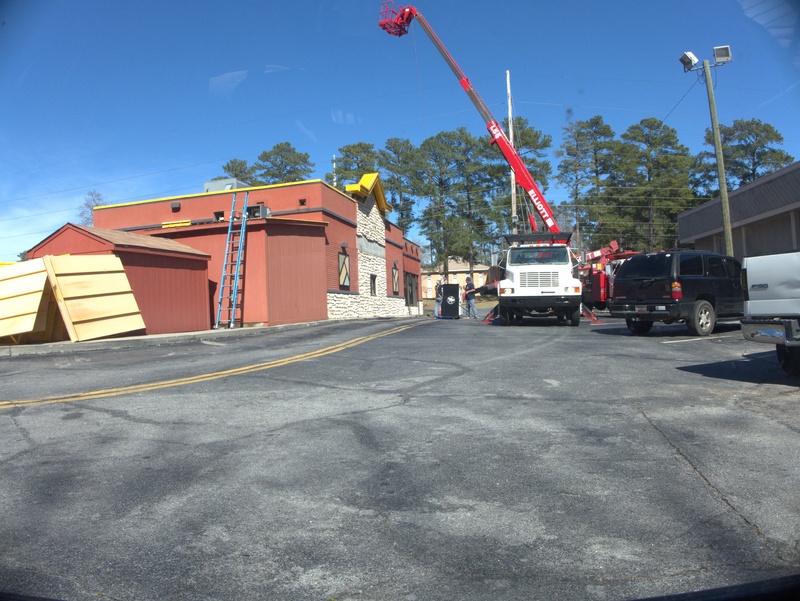 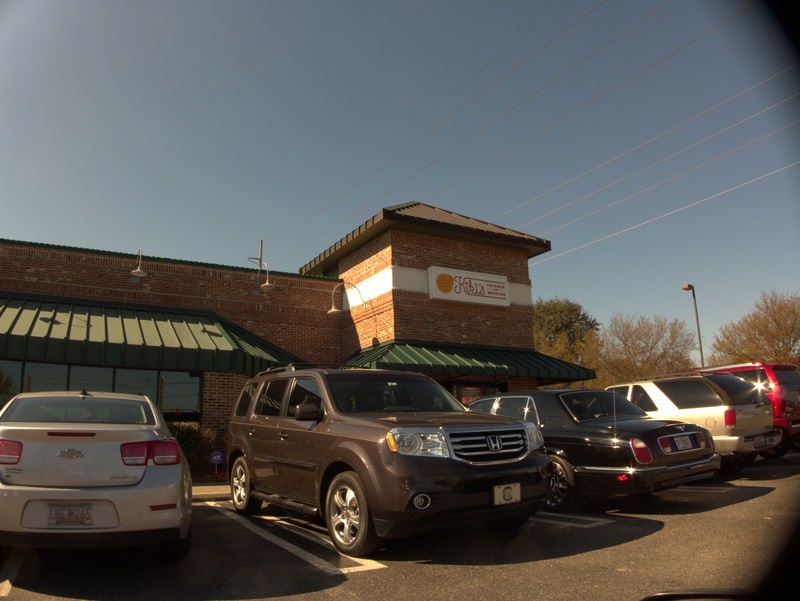 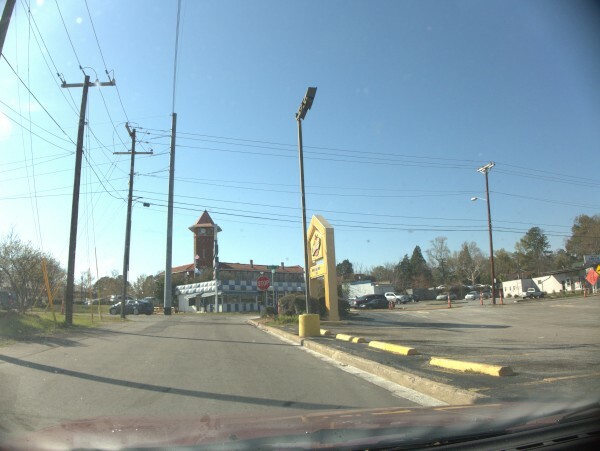 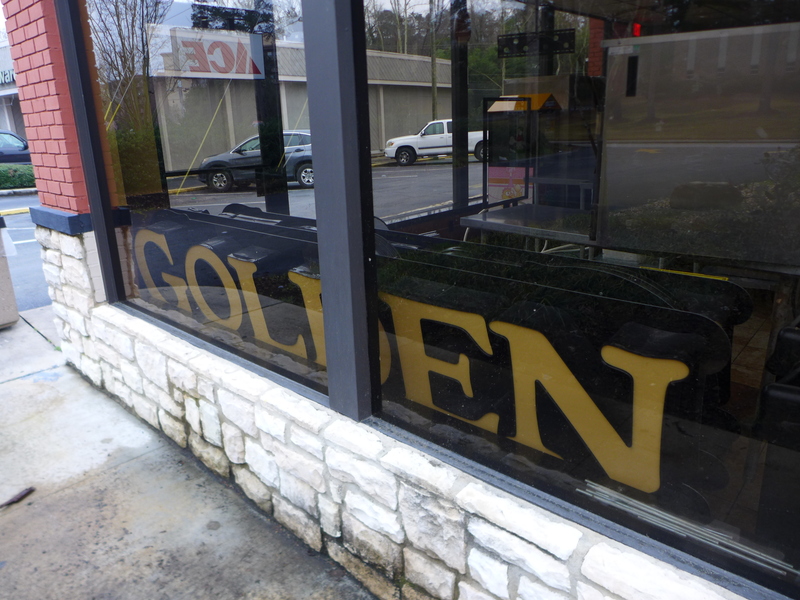 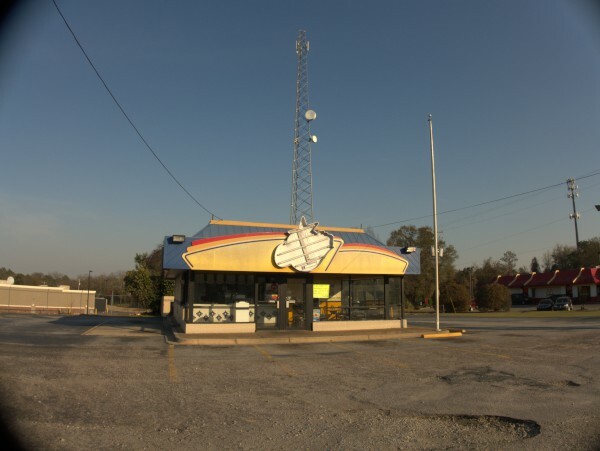 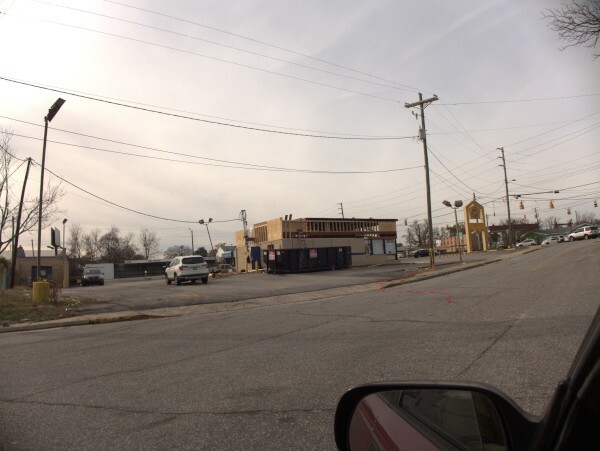 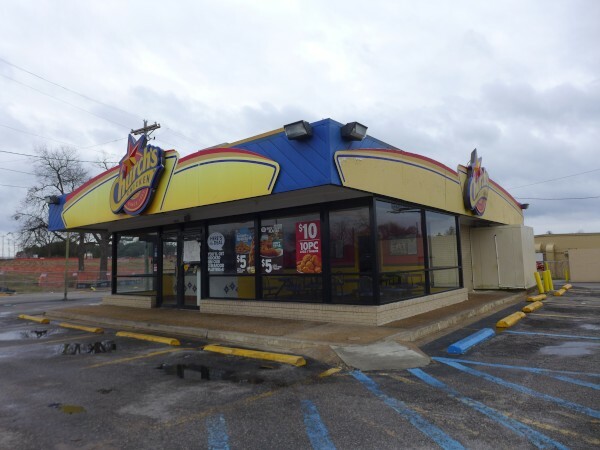 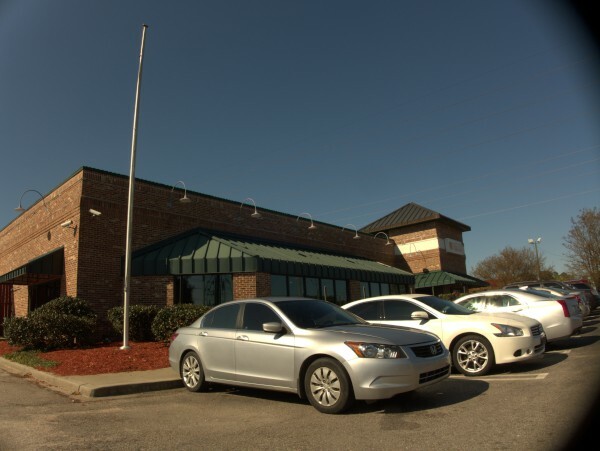 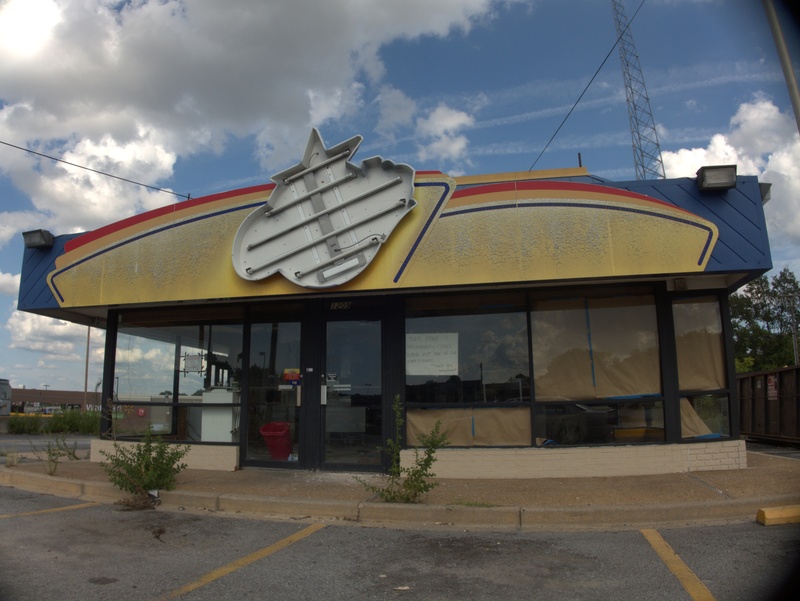 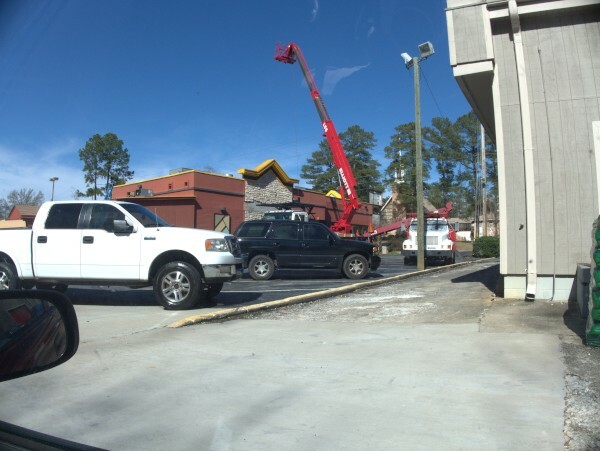 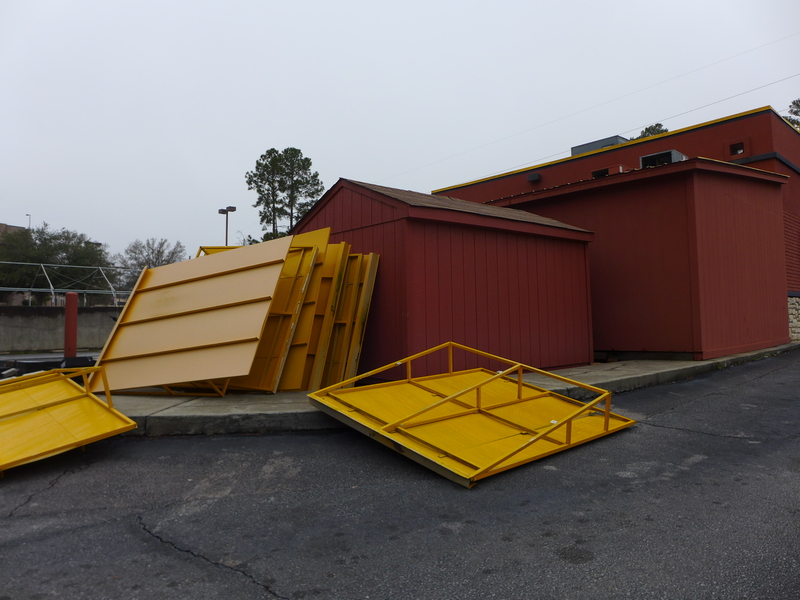 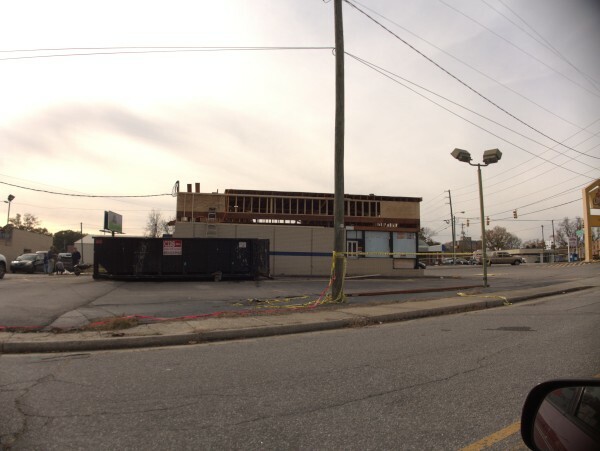 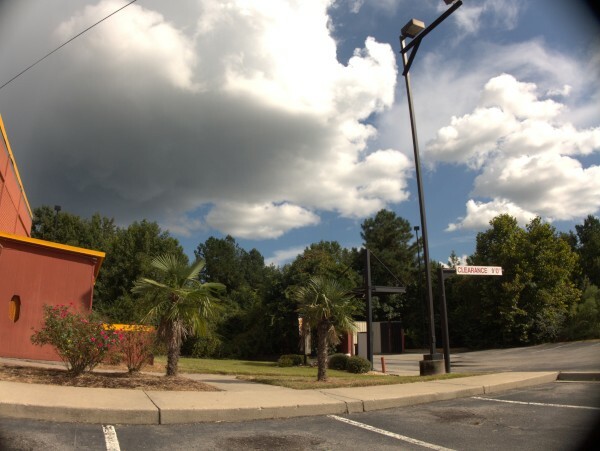 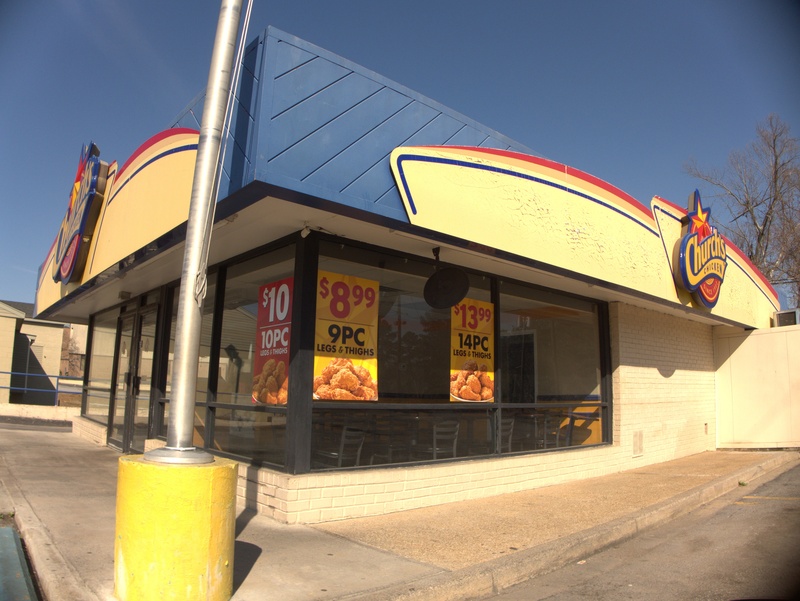 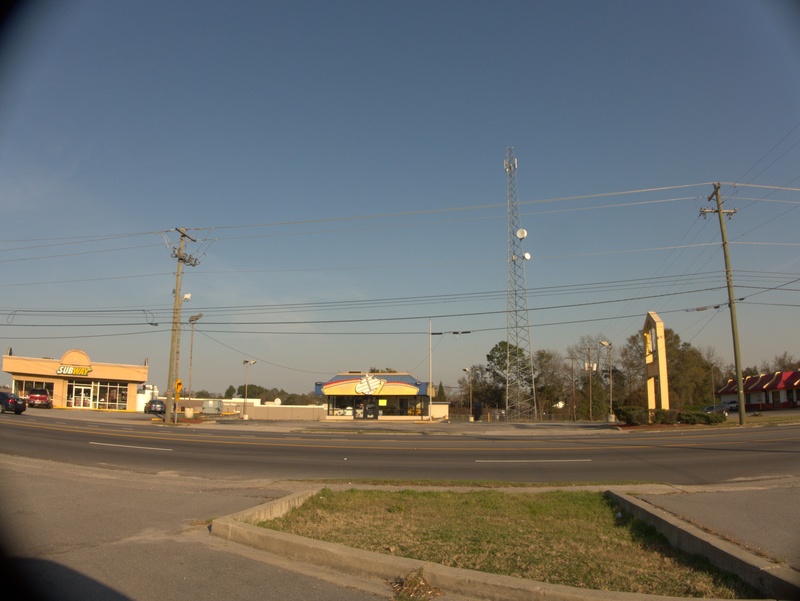 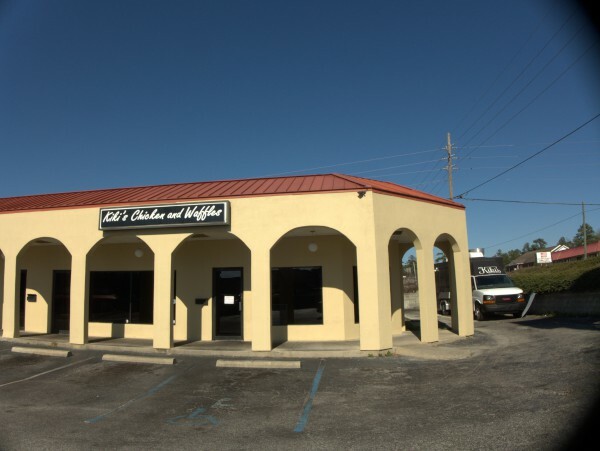 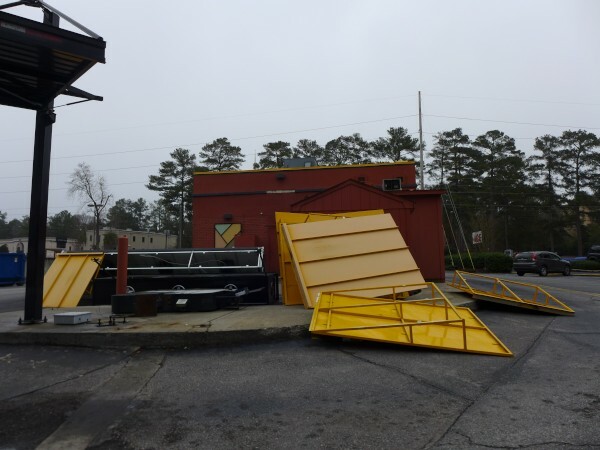 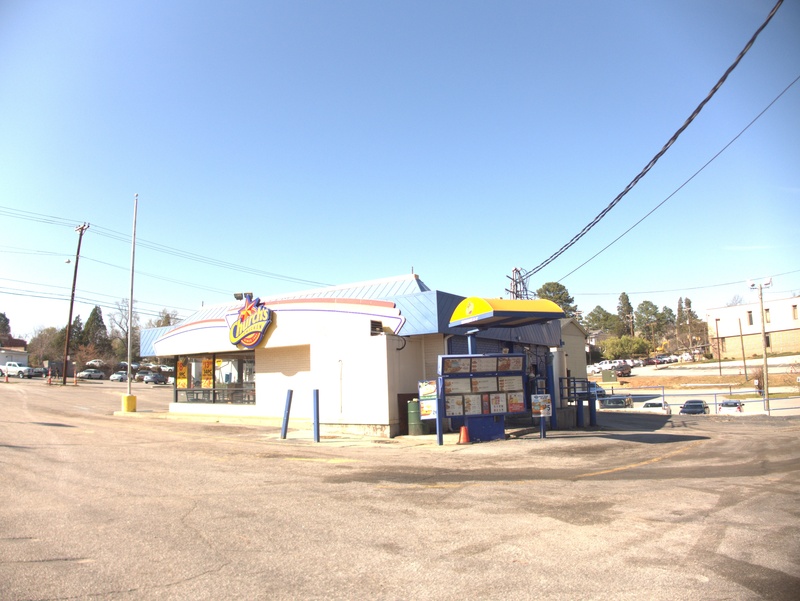 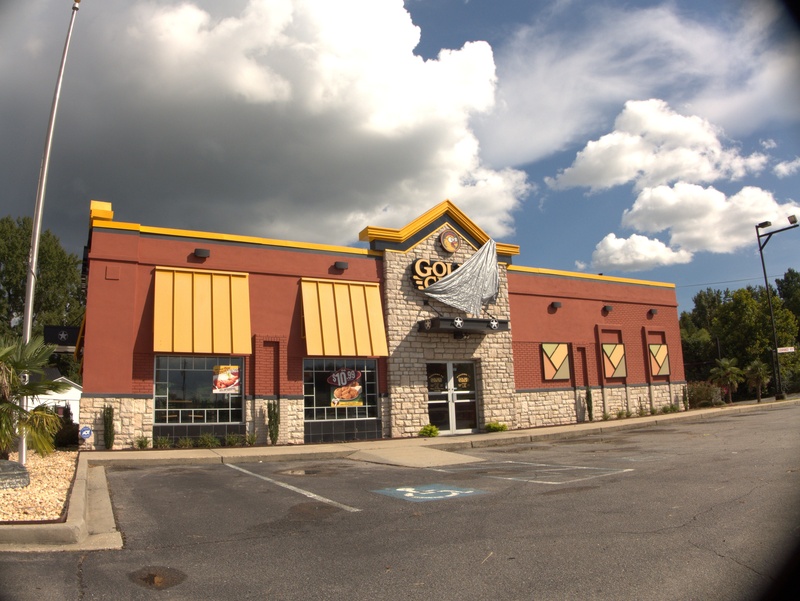 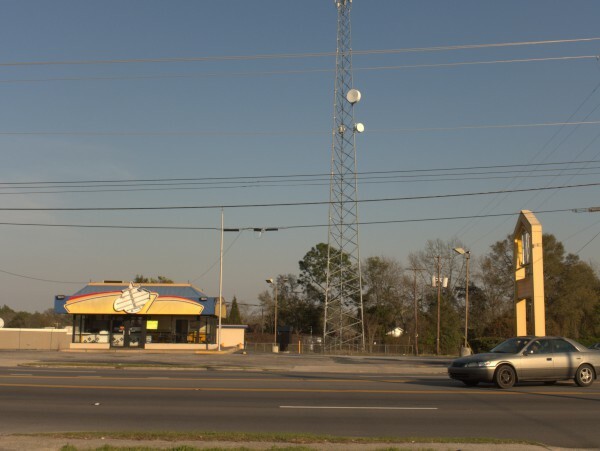 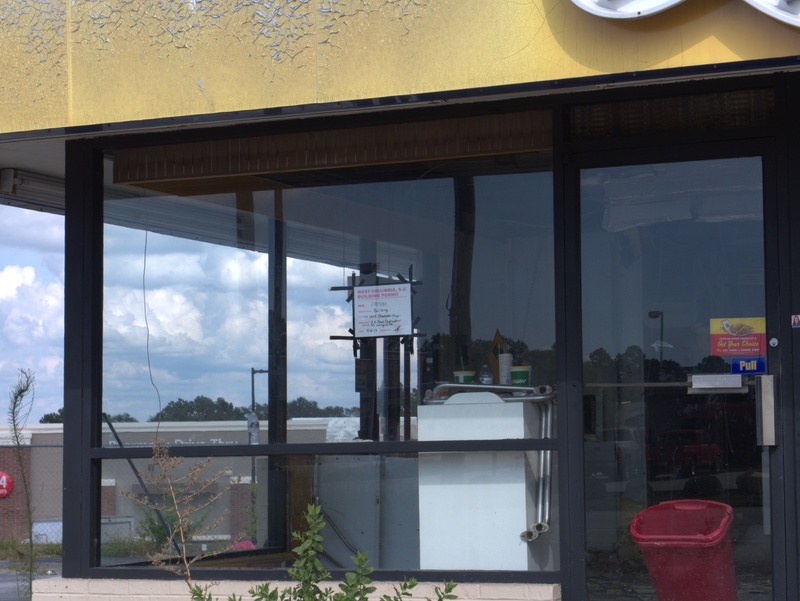 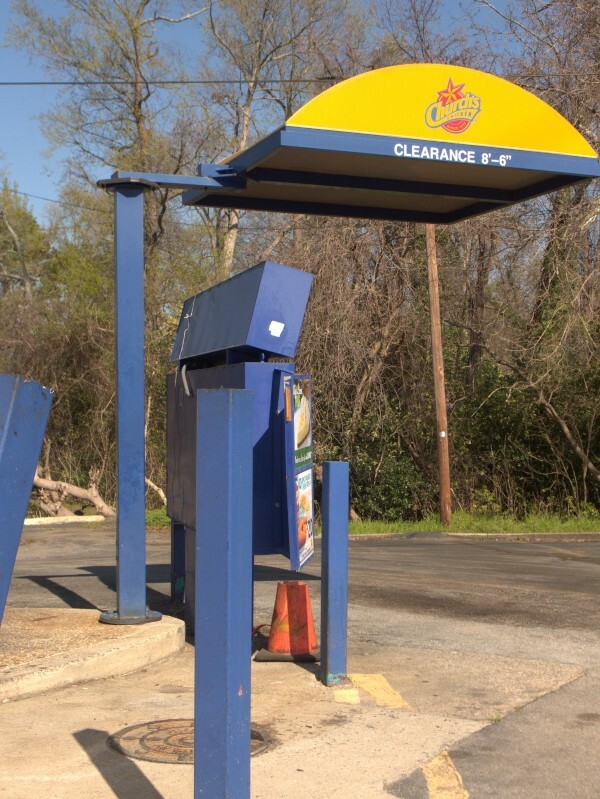 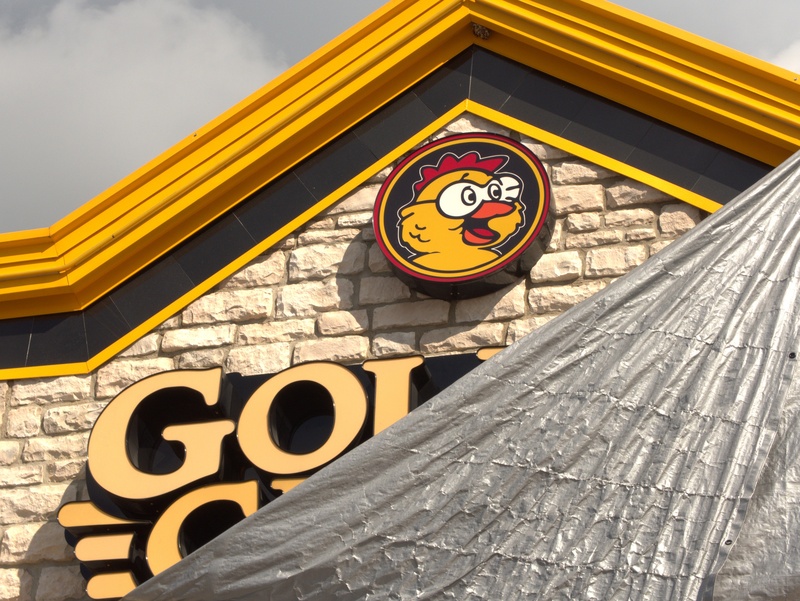 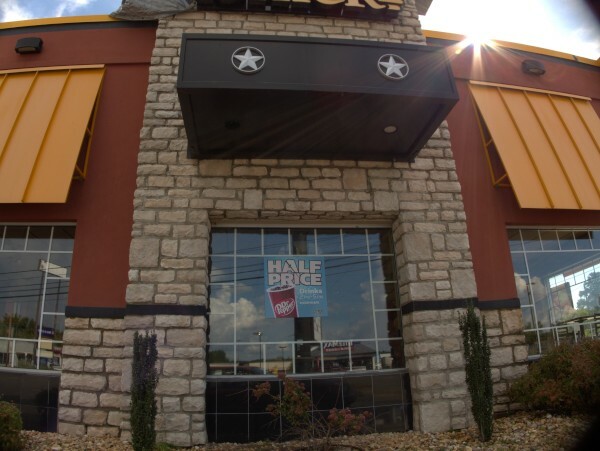 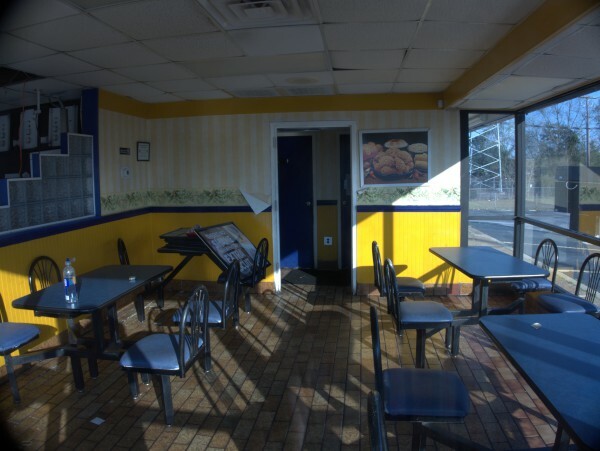 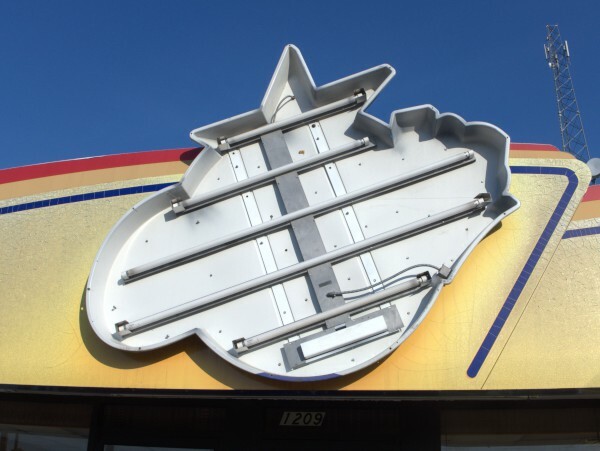 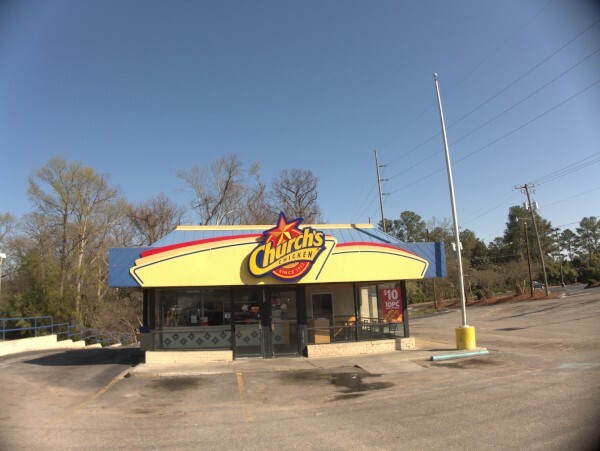 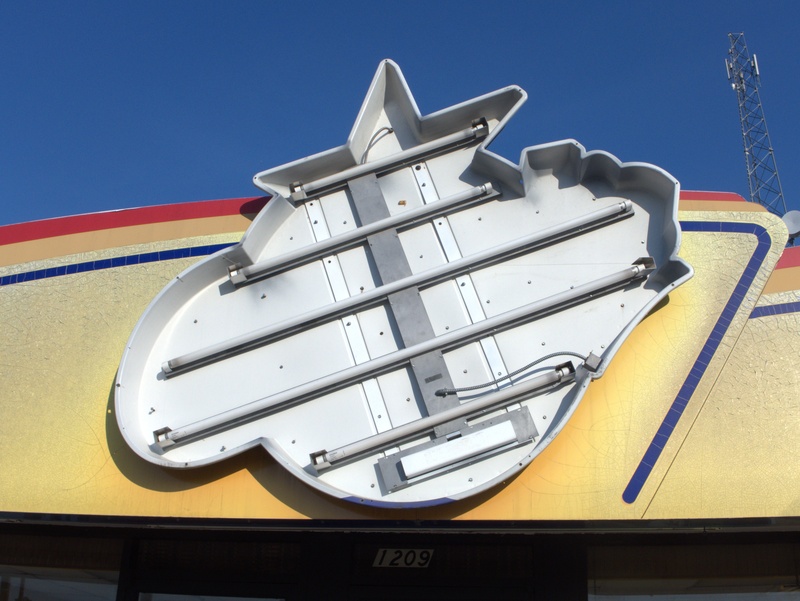 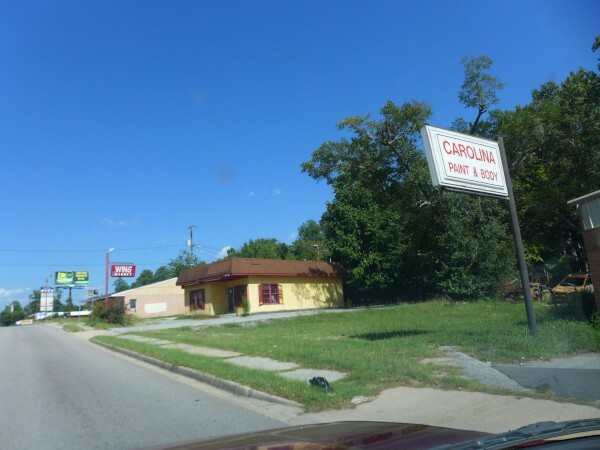 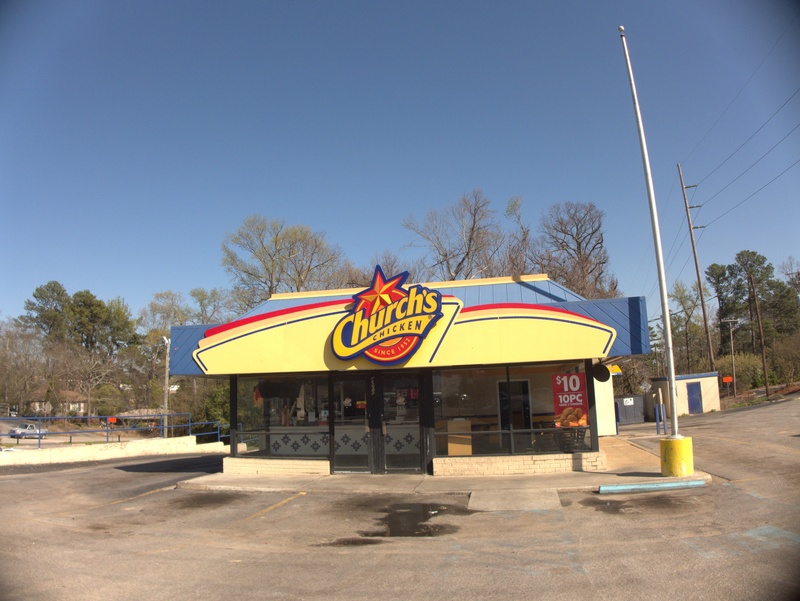 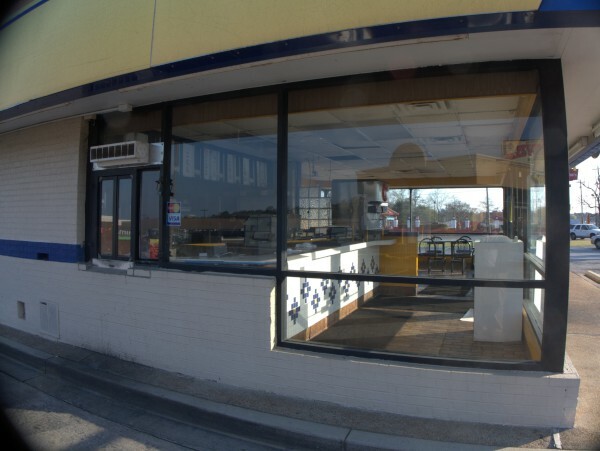 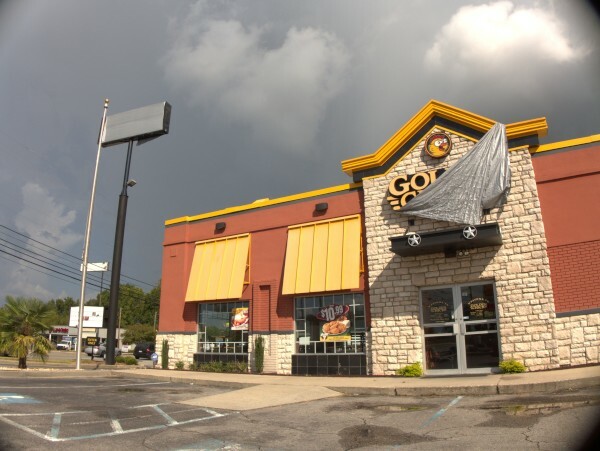 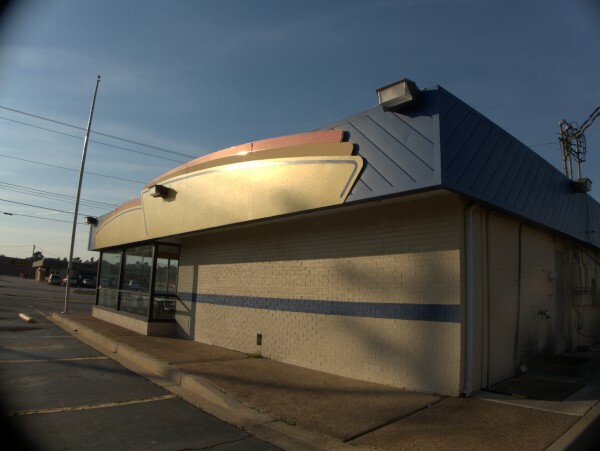 When I did a closing for the Manning location of Golden Chick, I wondered if the Columbia location might be next, as they opened about the same time. Interestingly however, google does not pull up any stories about closings or the chain being in trouble. 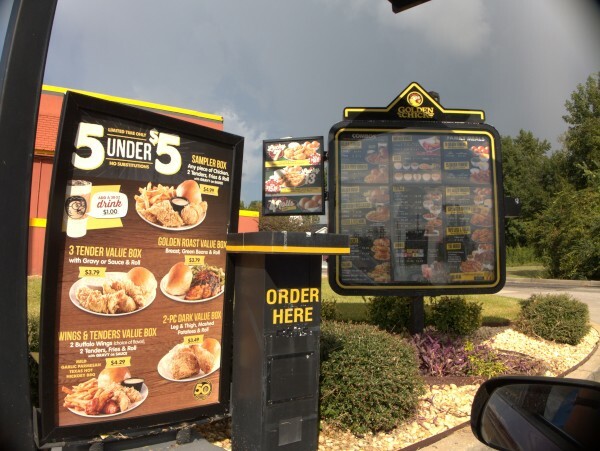 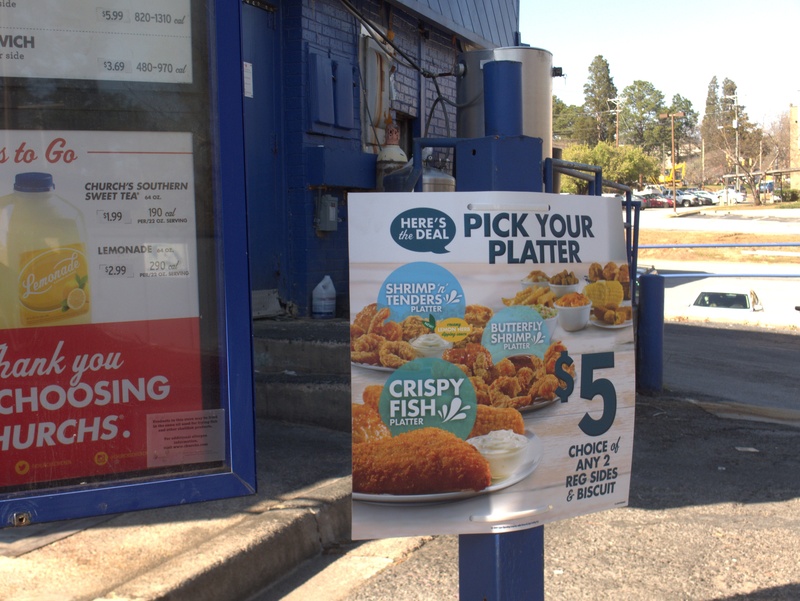 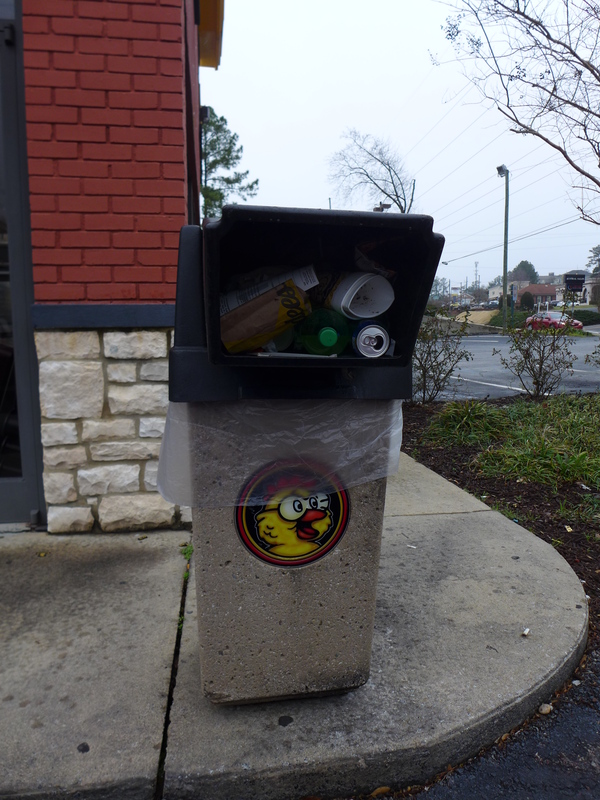 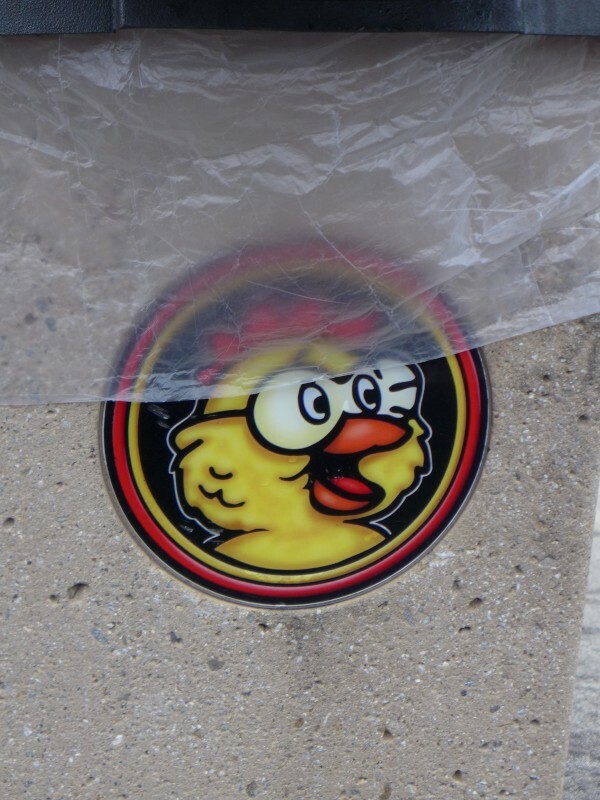 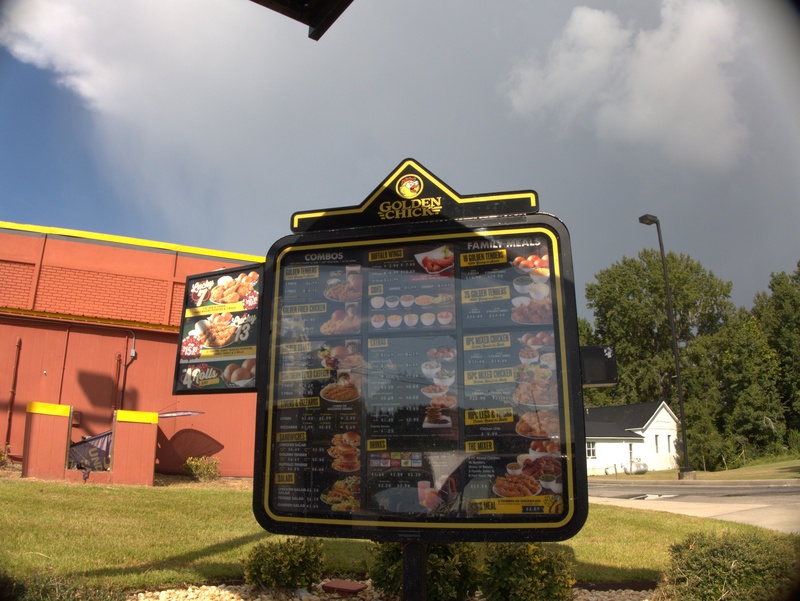 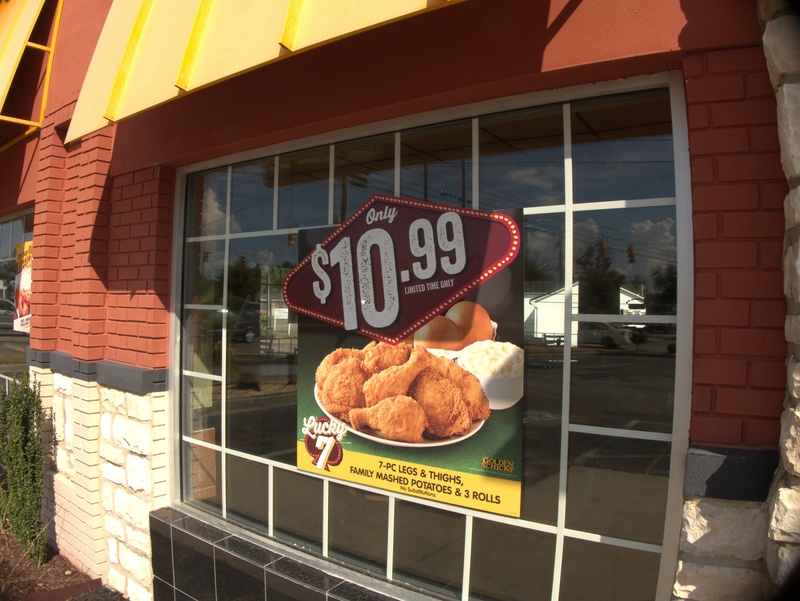 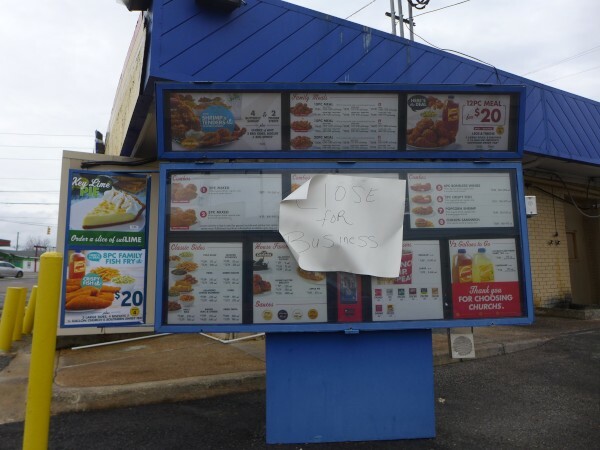 To the contrary, there are several stories to the effect that 2019 is looking to be a banner year for Golden Chick, so perhaps this chicken is only crossing the road locally. 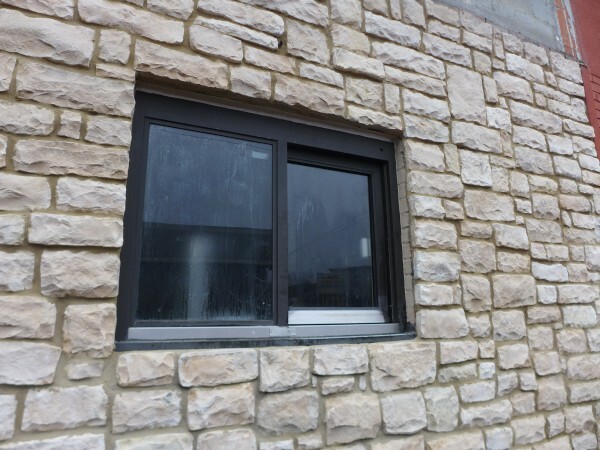 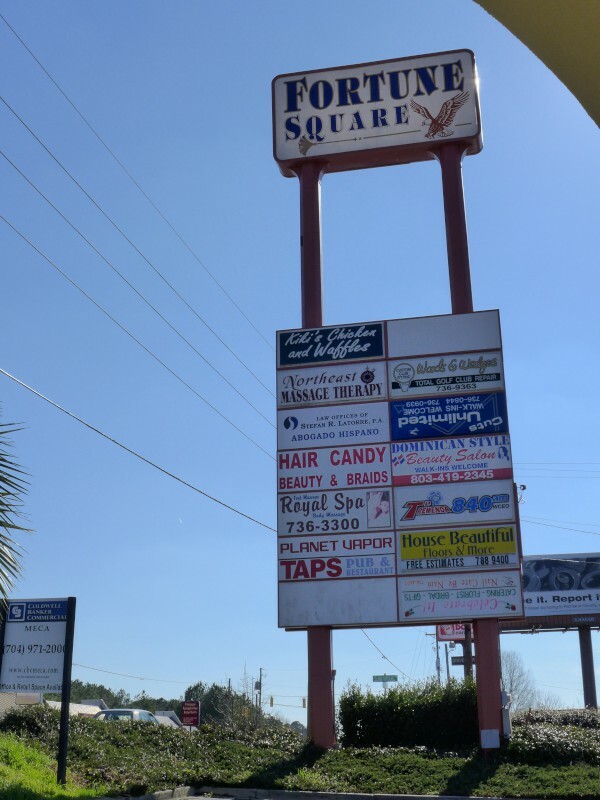 UPDATE 21 February 2019: Fixed transposed address in post title and tags. 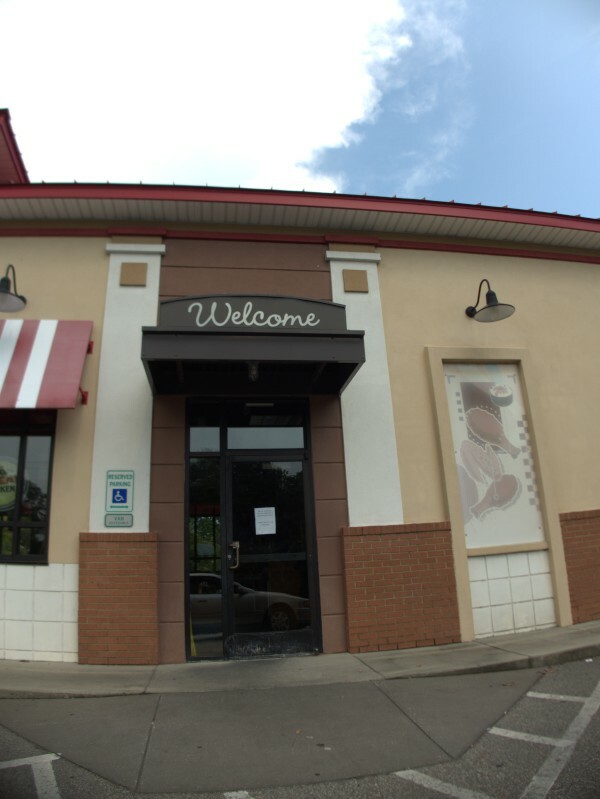 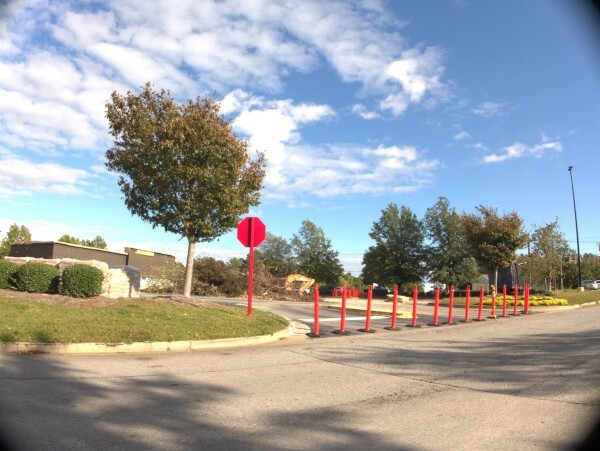 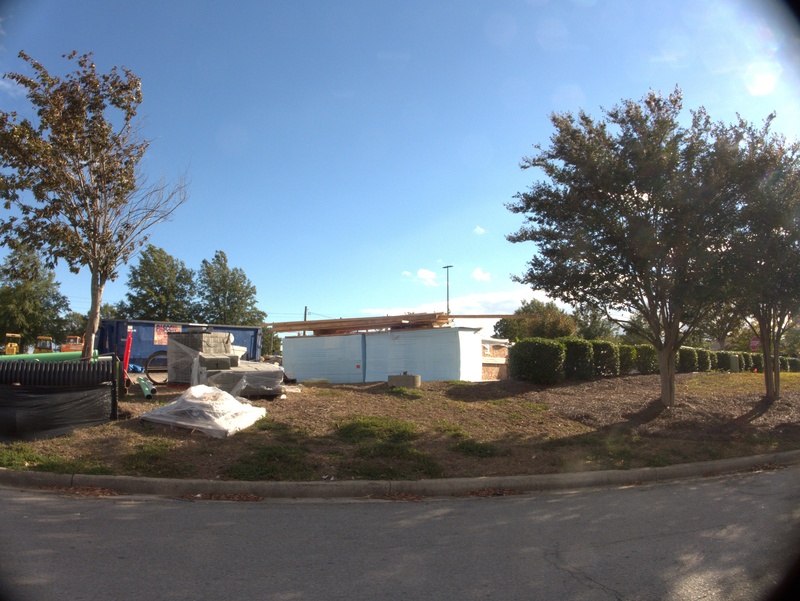 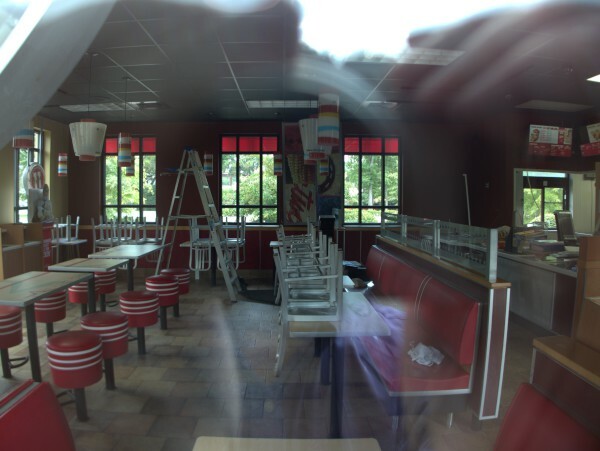 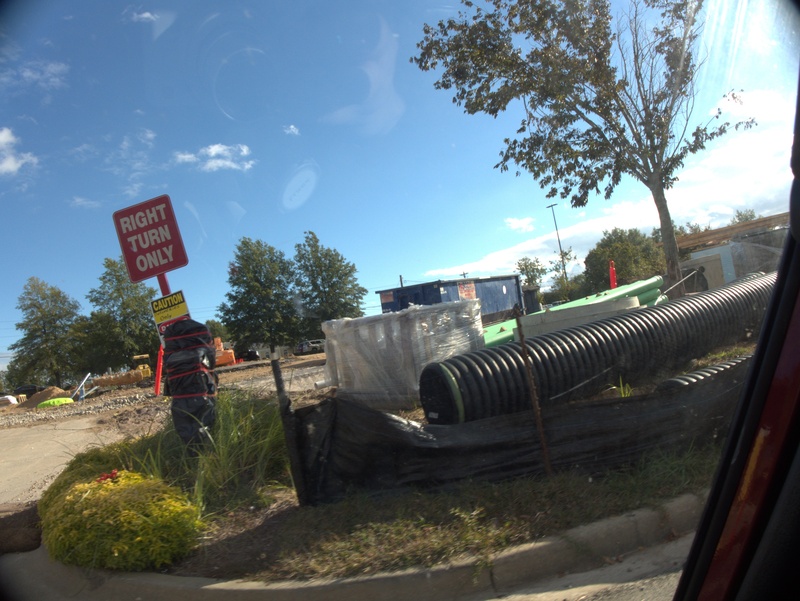 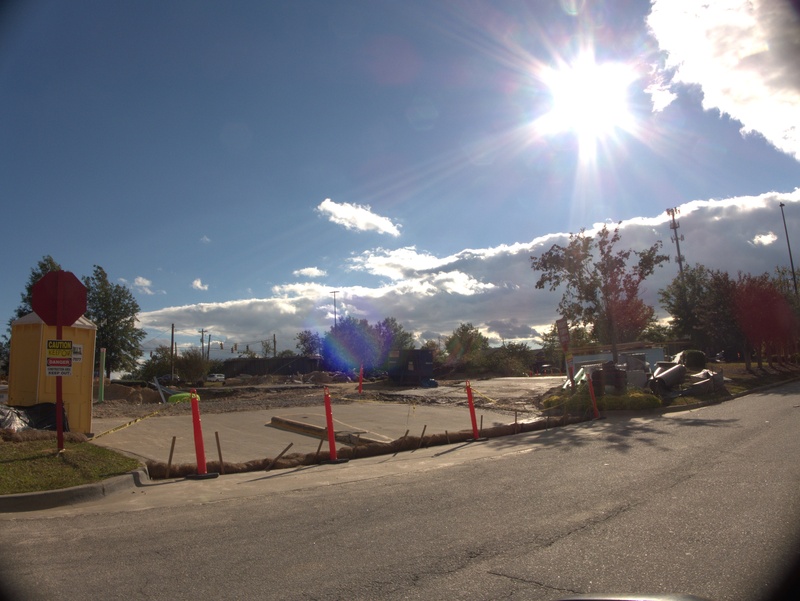 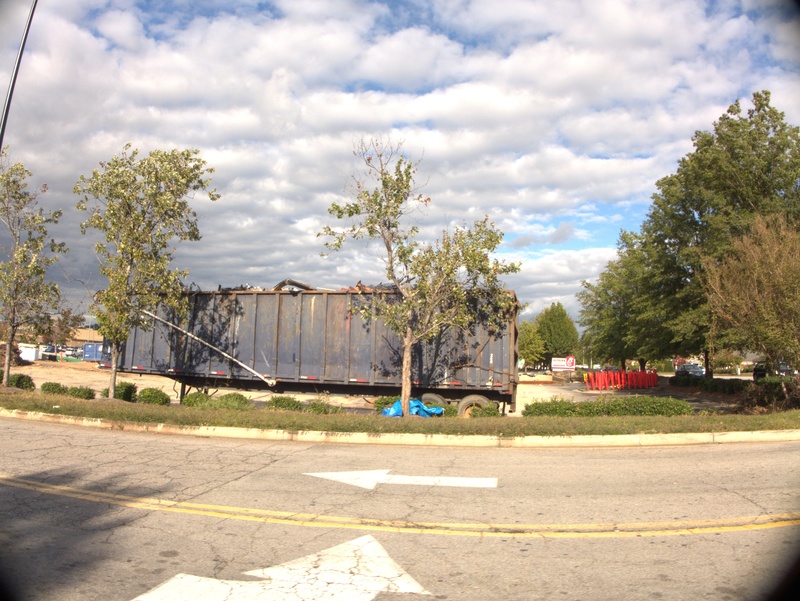 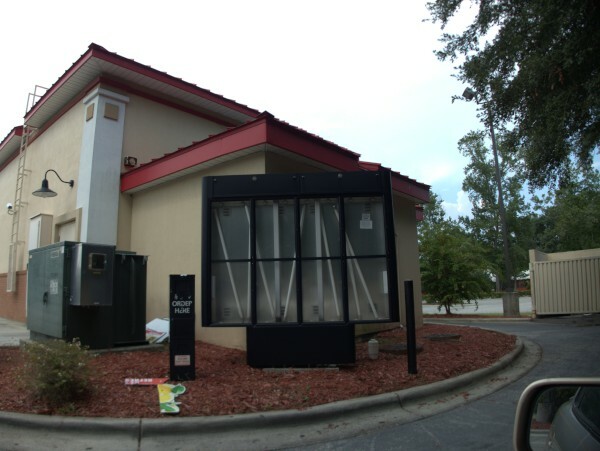 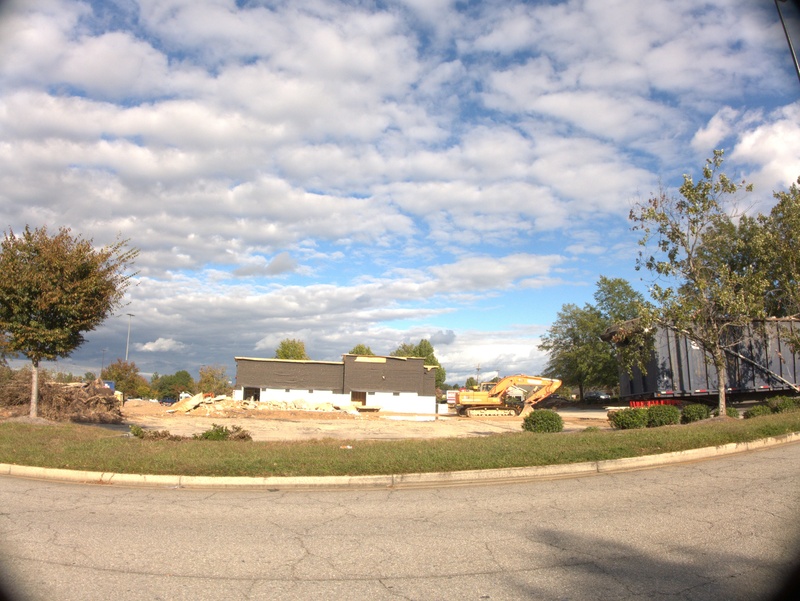 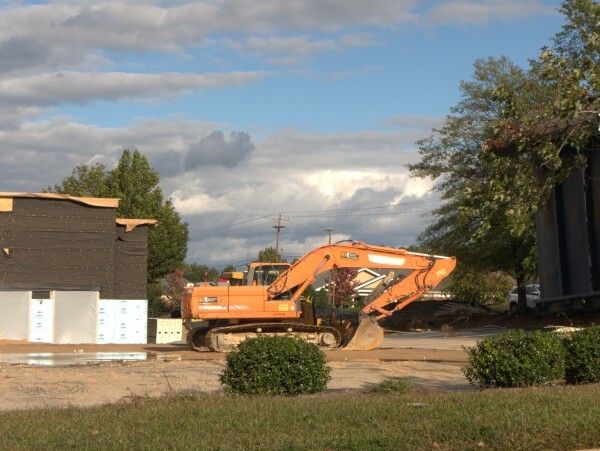 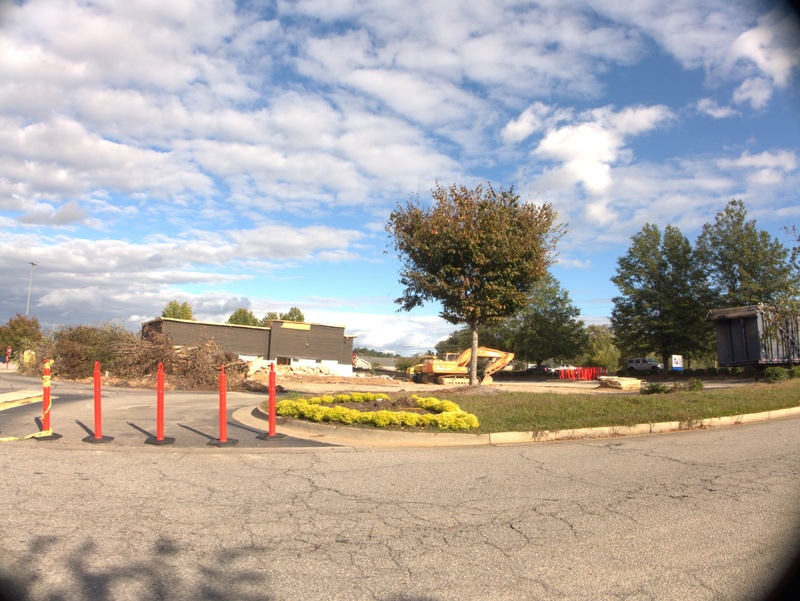 Commenter Beth noted a while back that this Chick-fil-A location was being torn down and rebuilt with double drive-through lanes. The last time I looked at it, it was still open, though with some lot construction going on. 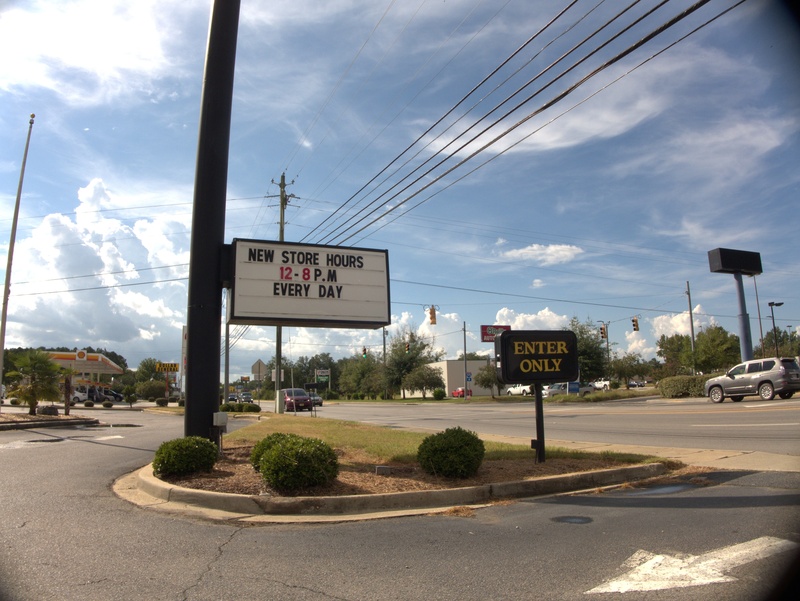 Now they have definitely gotten into the rebuild phase. 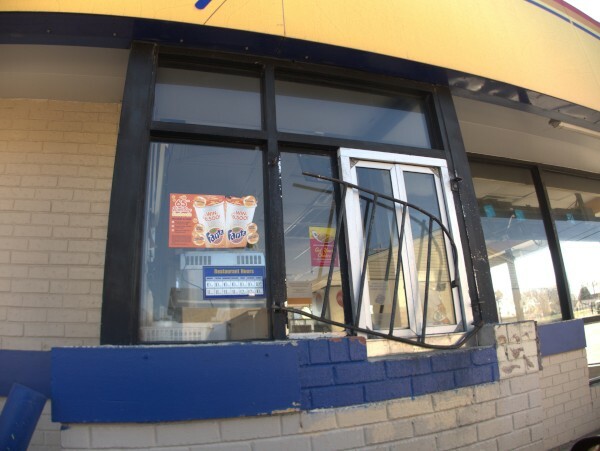 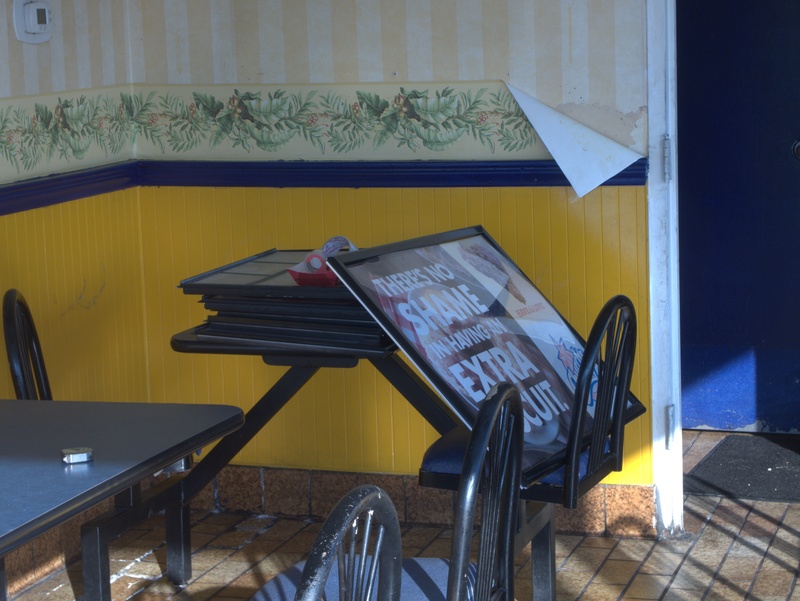 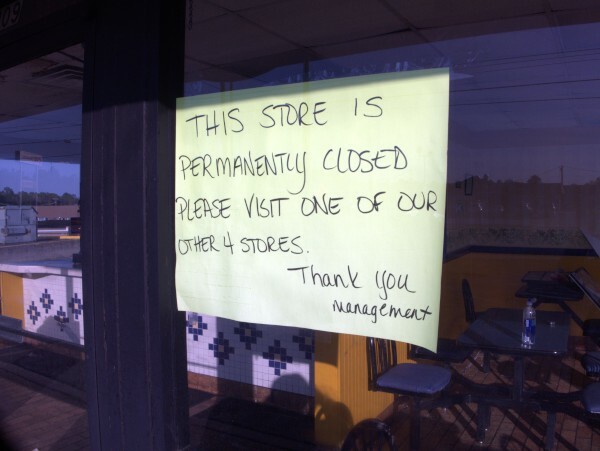 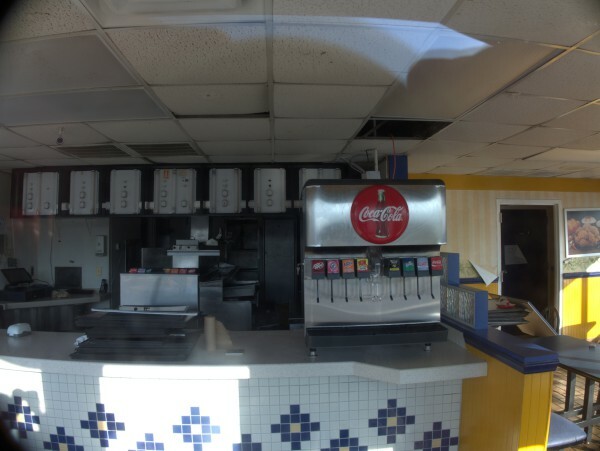 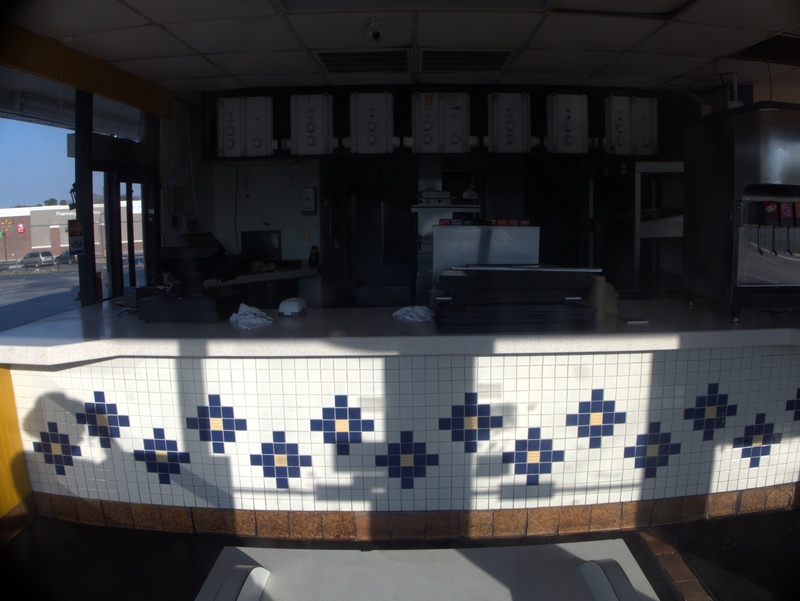 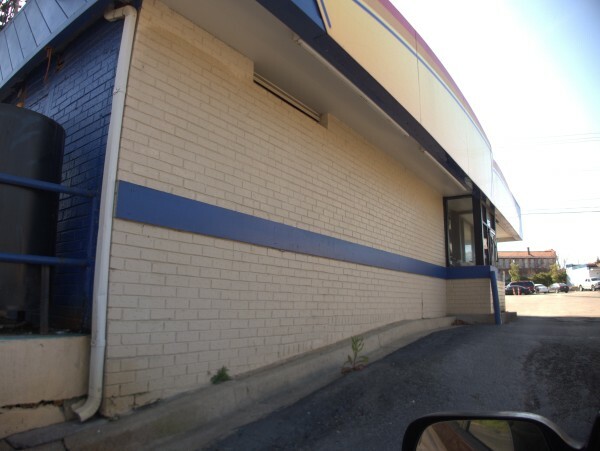 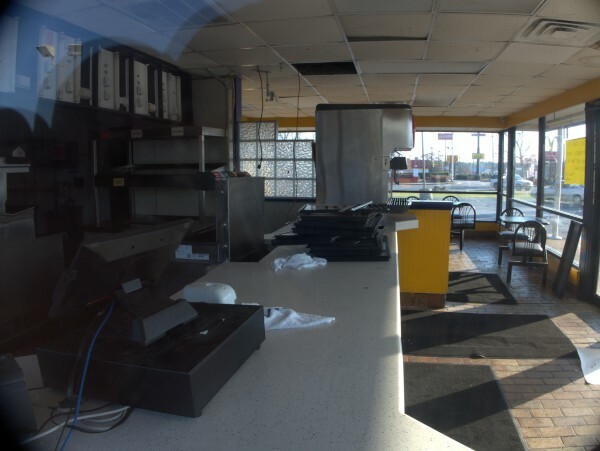 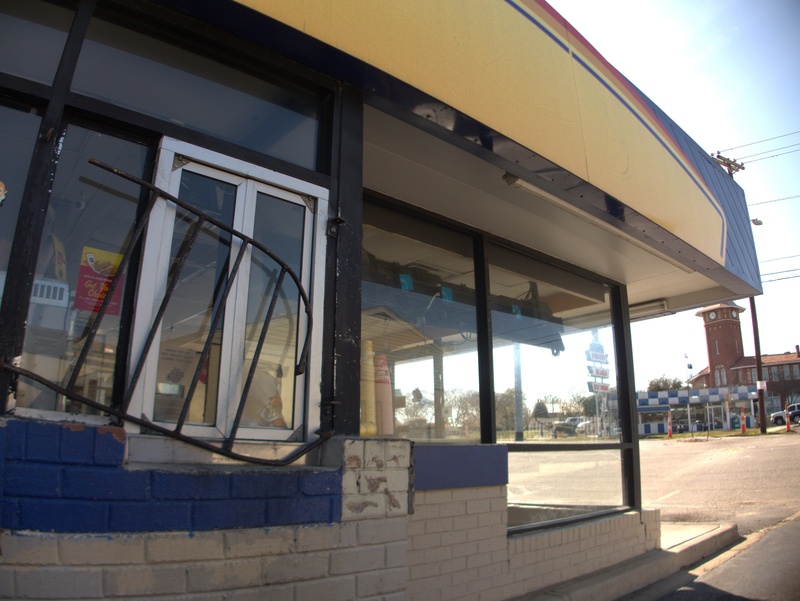 I noticed on one of my recent drives to the beach that the Golden Chick in Manning had closed. 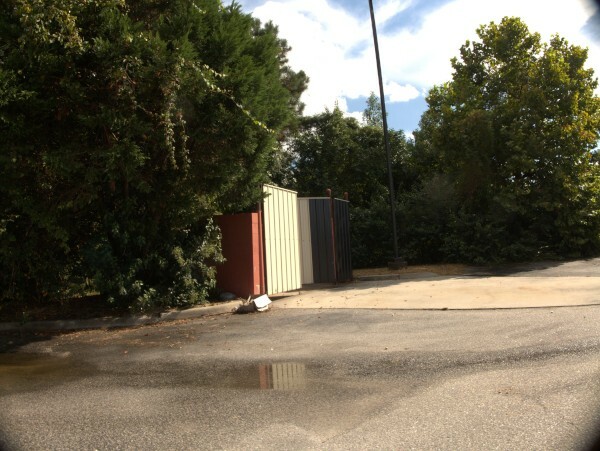 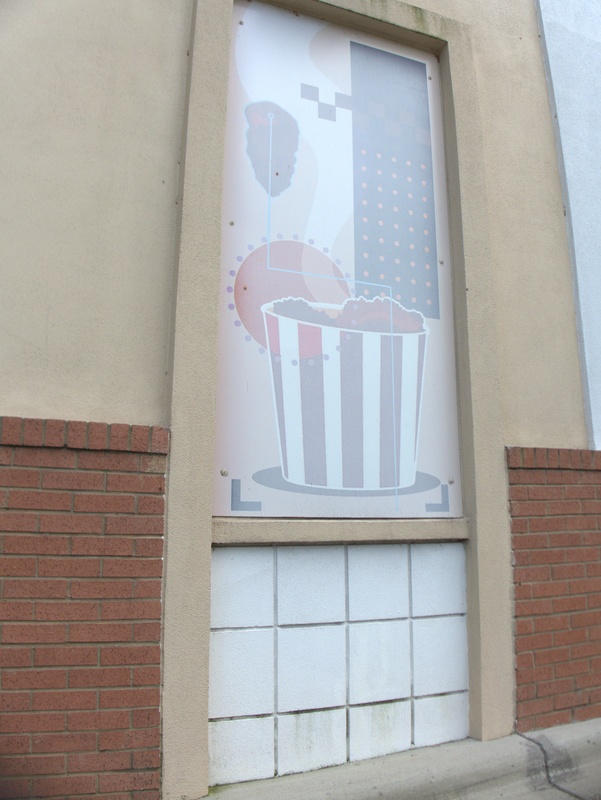 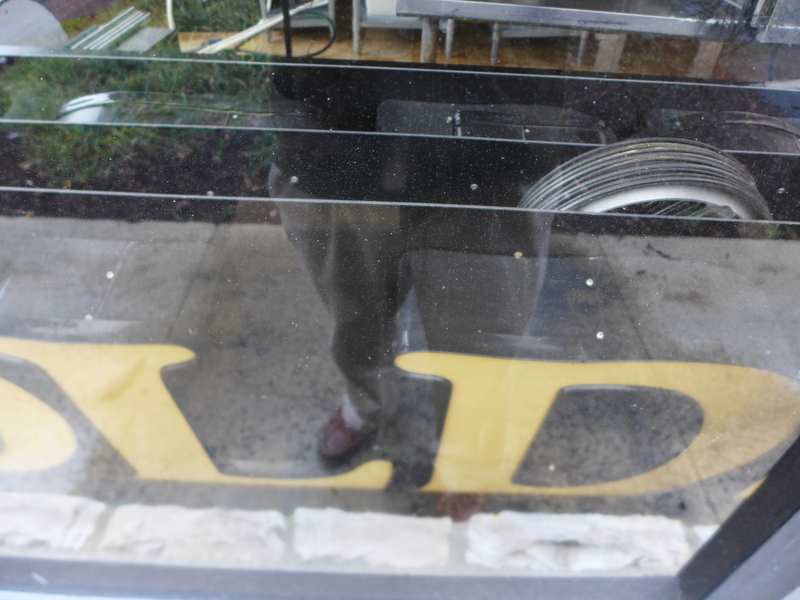 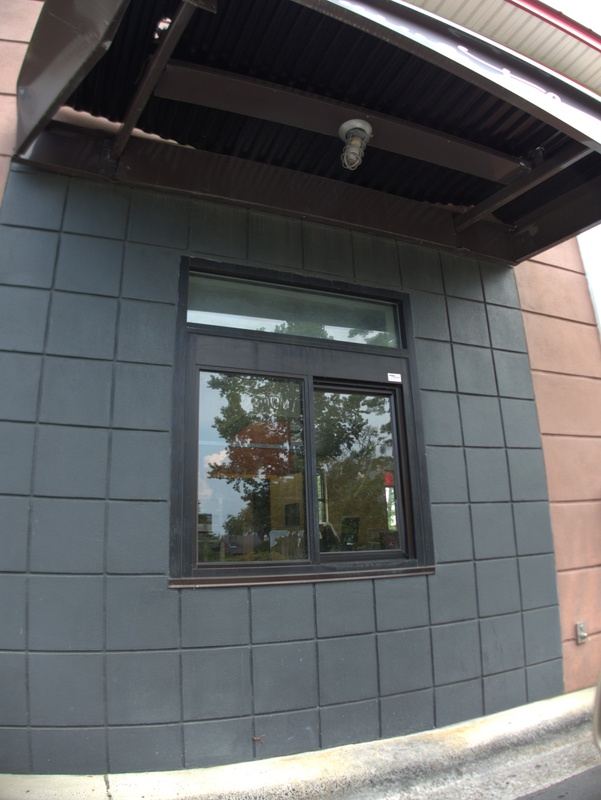 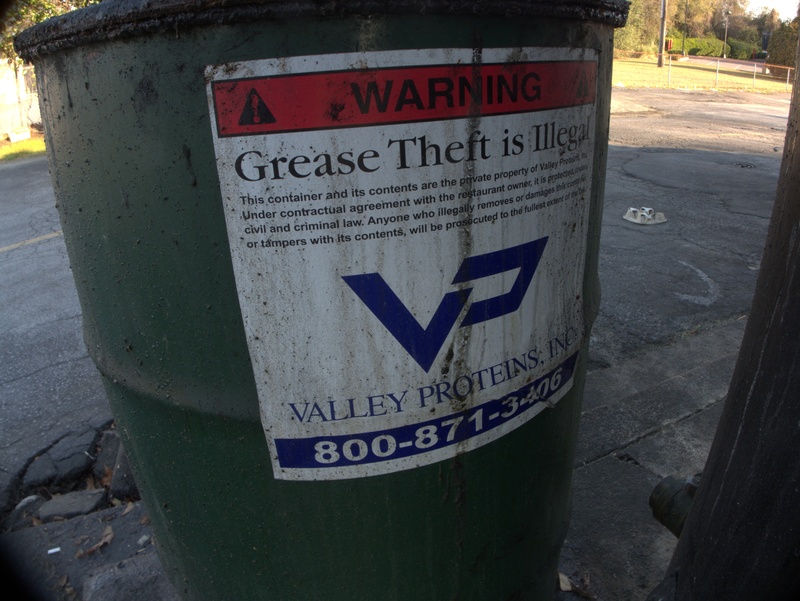 It appears to be very recent, and there is no closed sign posted, though some attempt to cover the logo has been made. 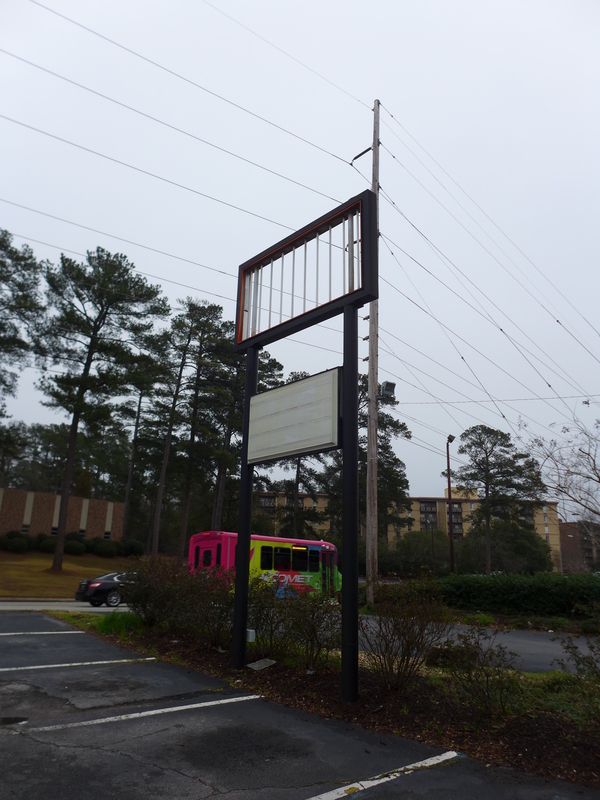 If you look at the roadside marquee, you can see Sign #1 in play, which was apparently the only warning given. 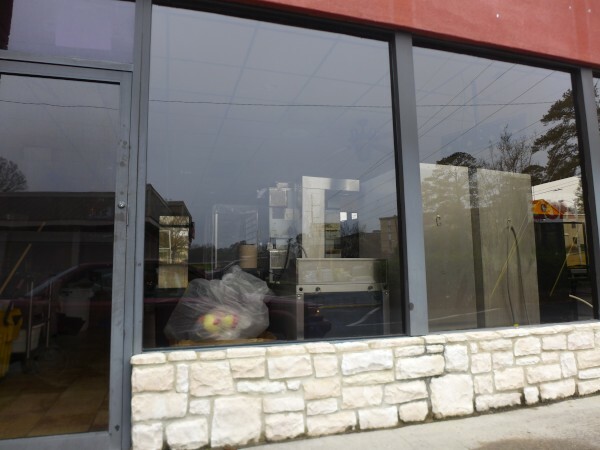 Looking at Yelp it appears this store opened in 2014, which I believe is about the time the one on Beltline did. 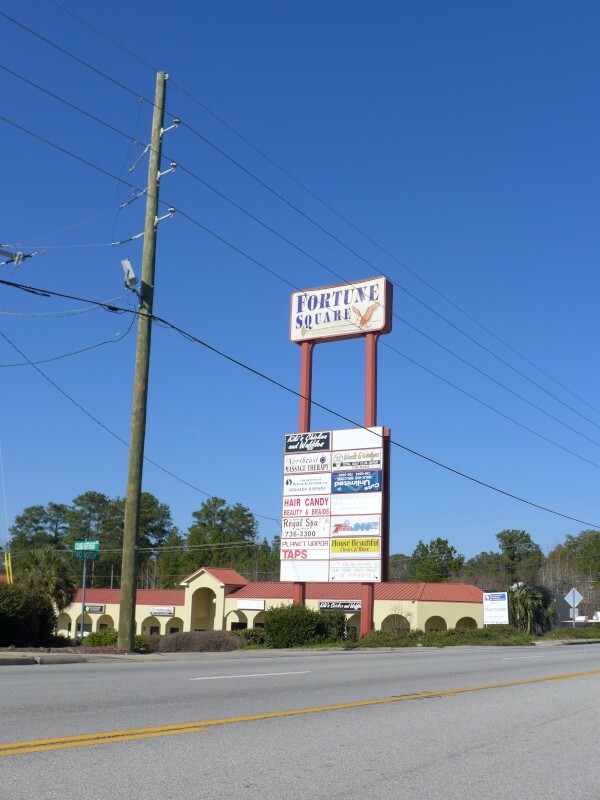 The reviews are mostly good, I'm not sure what happened, unless it was just a bit too far from I-95 to get the traffic it needed. 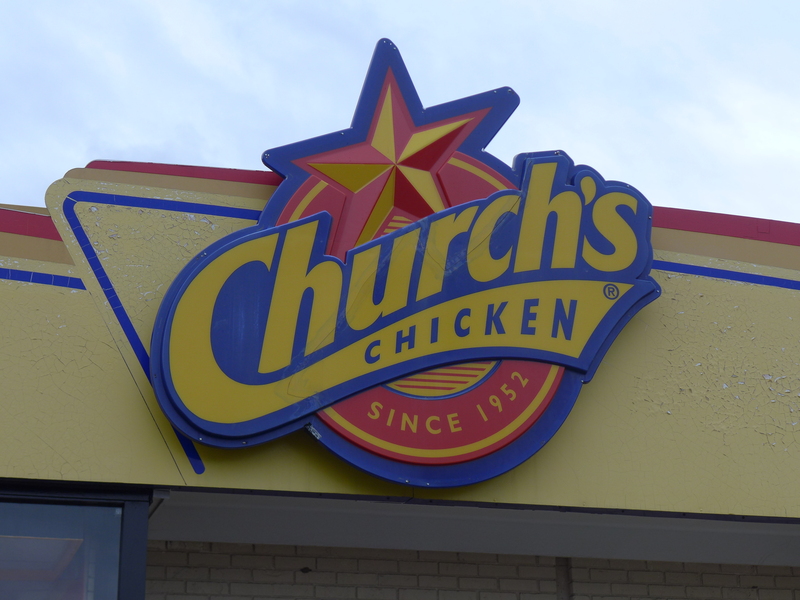 Here's another Church's Chicken gone. 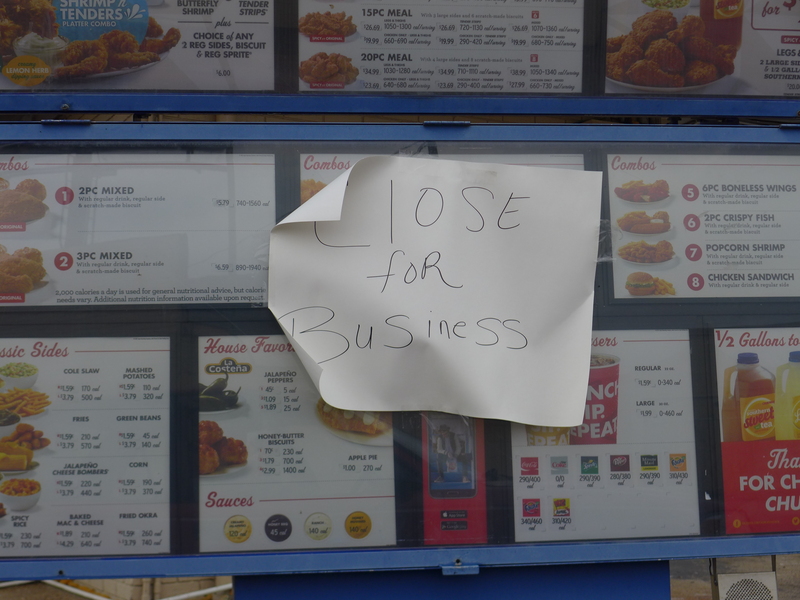 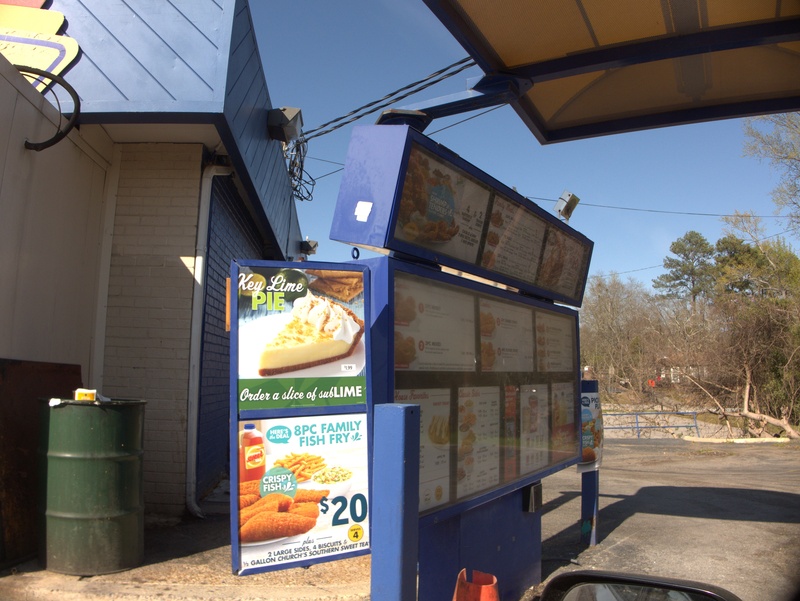 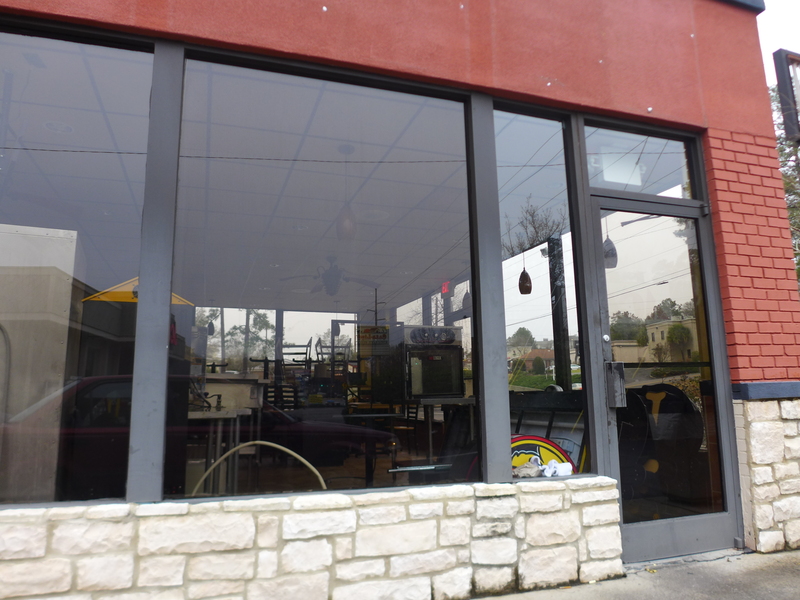 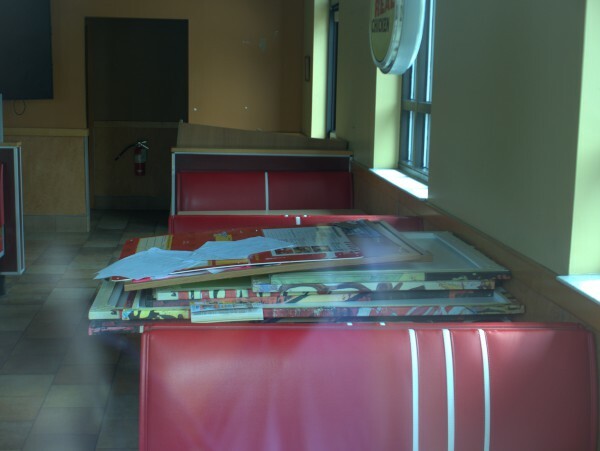 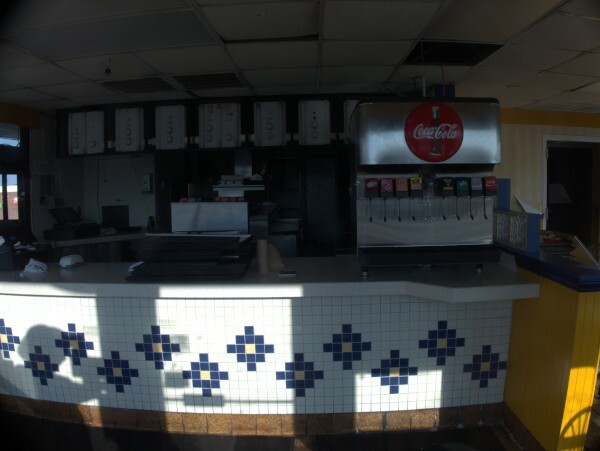 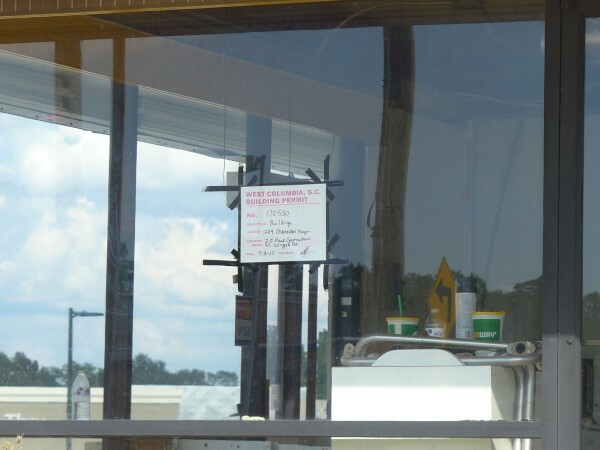 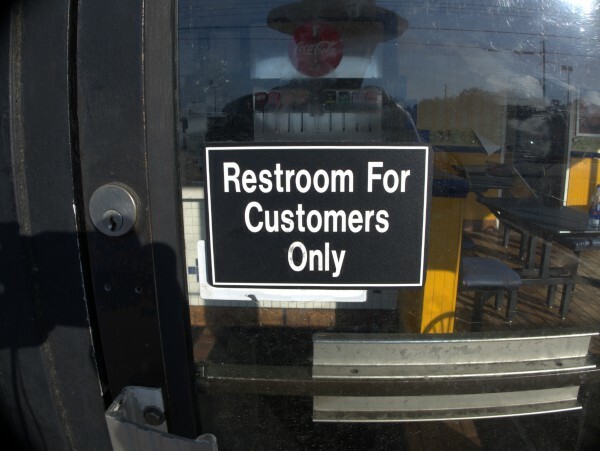 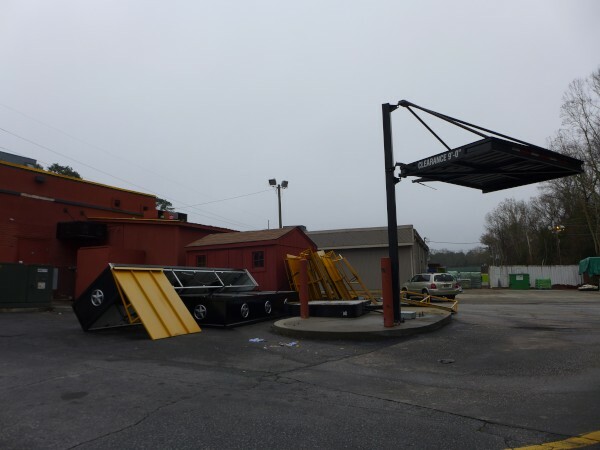 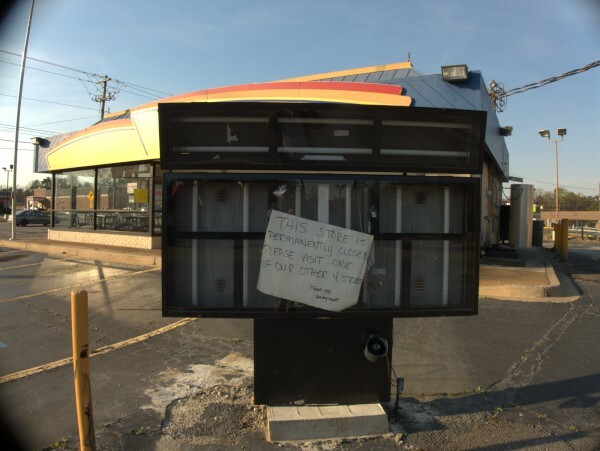 This one is recent enough that almost the only sign that the place is closed is the fact that its not open: All the signage, drive through menus and fixtures are still in place. 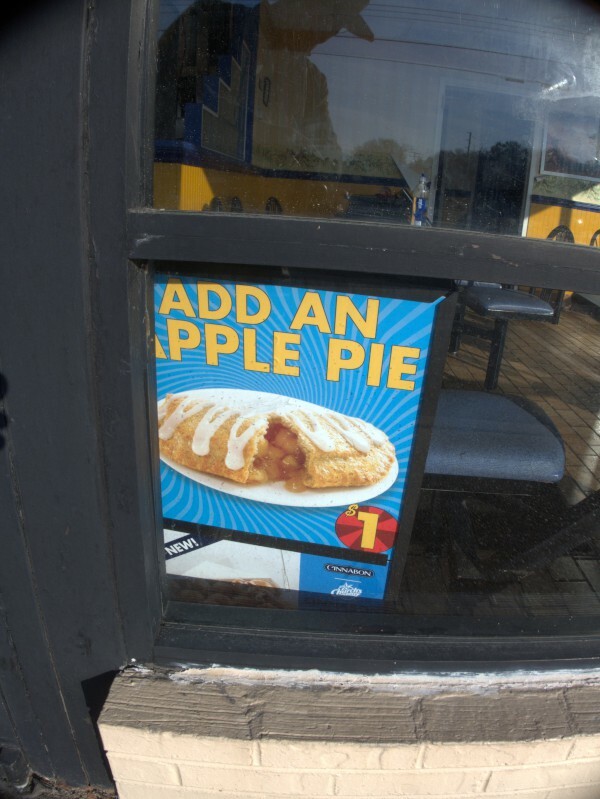 That's a pretty good looking piece of pie. 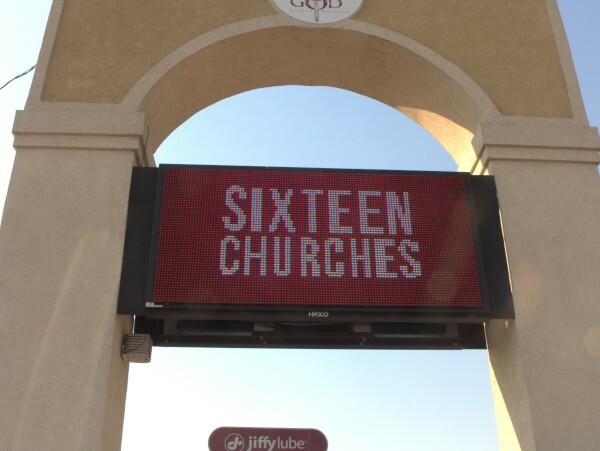 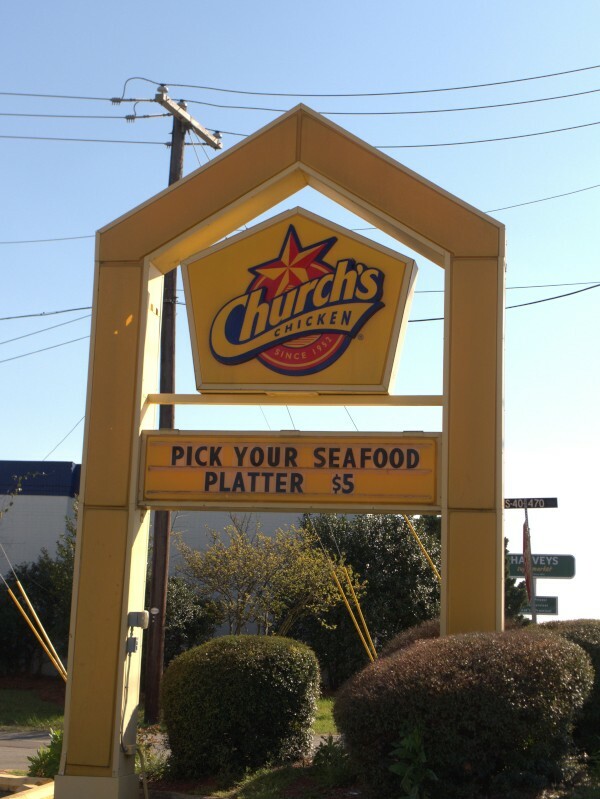 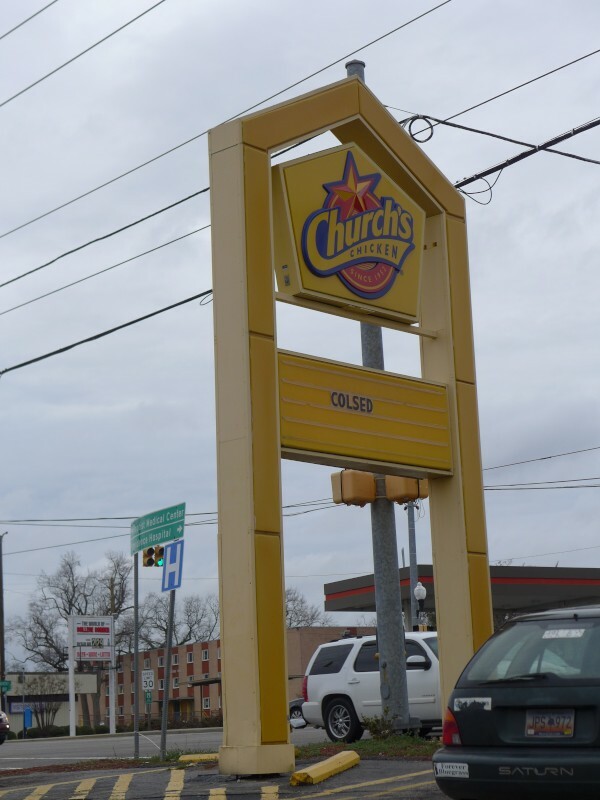 As you can see from the sign, this Church's Chicken at the foot of Gonzales Gardens and in the location of the old Drake's is now closed, or colsed, if you prefer. 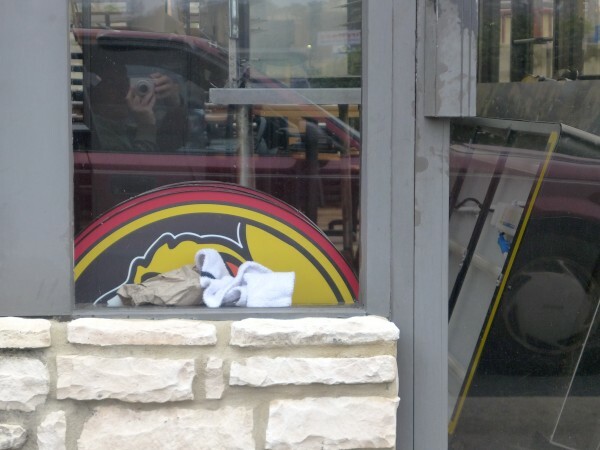 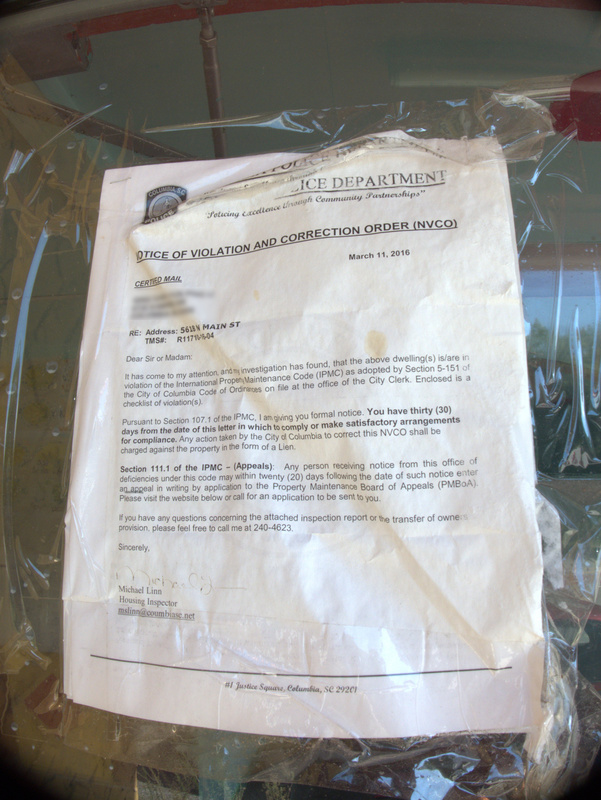 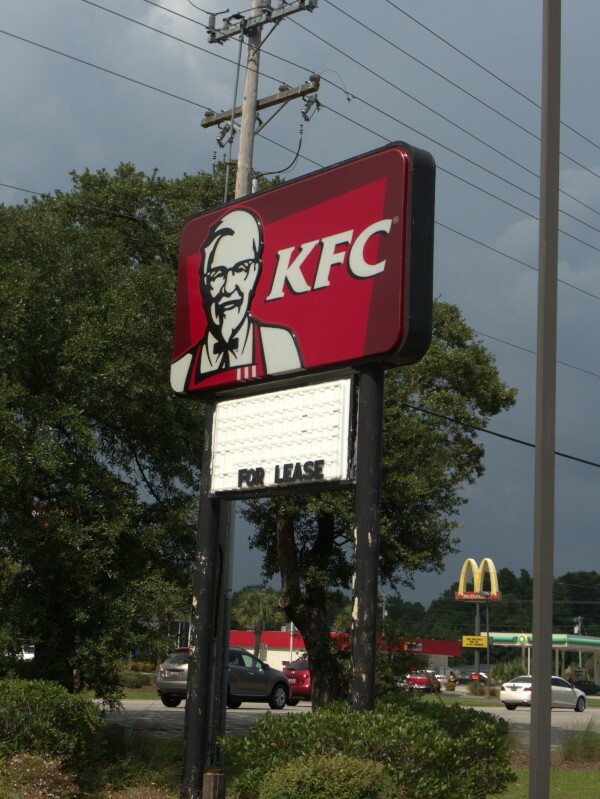 I would guess this means a little more business for the KFC on the next block up, but *this* bird has flown the coop. 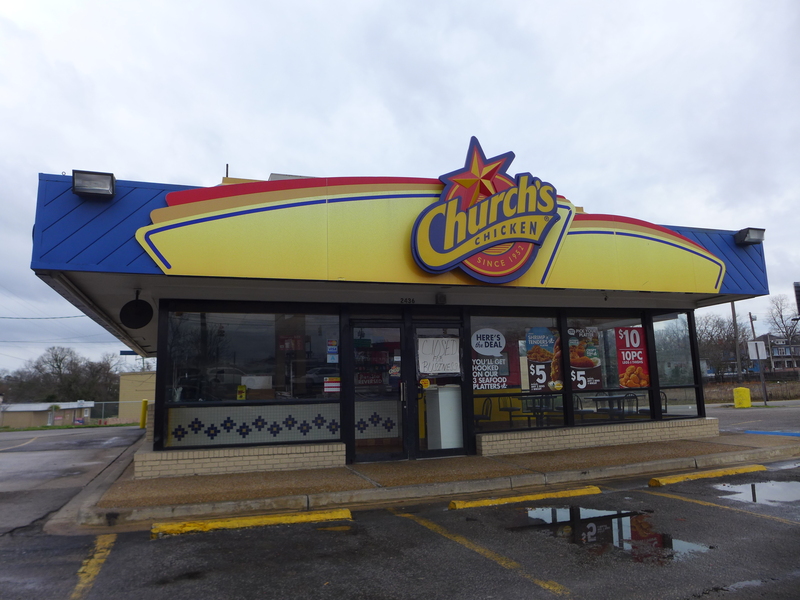 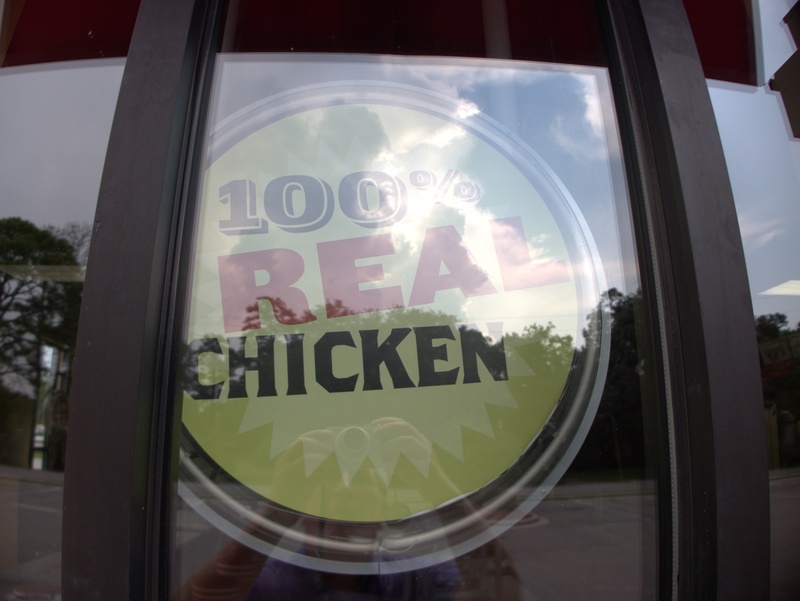 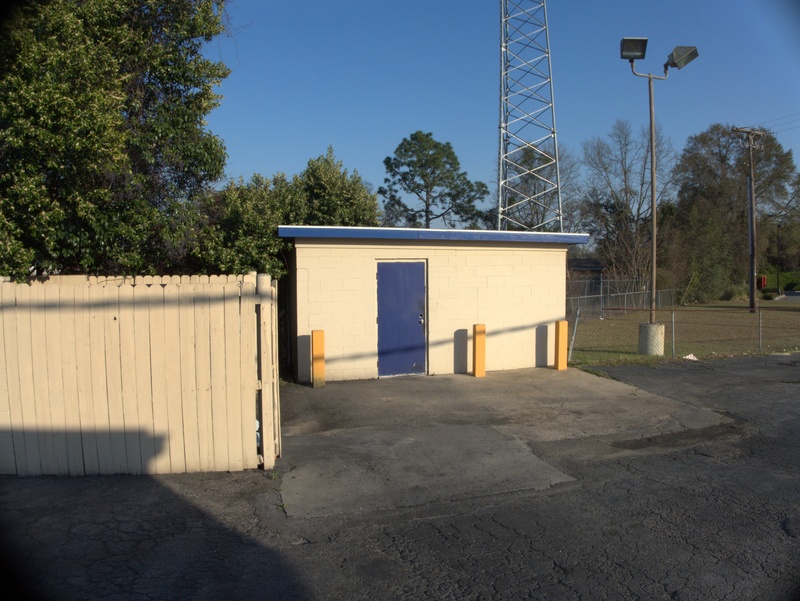 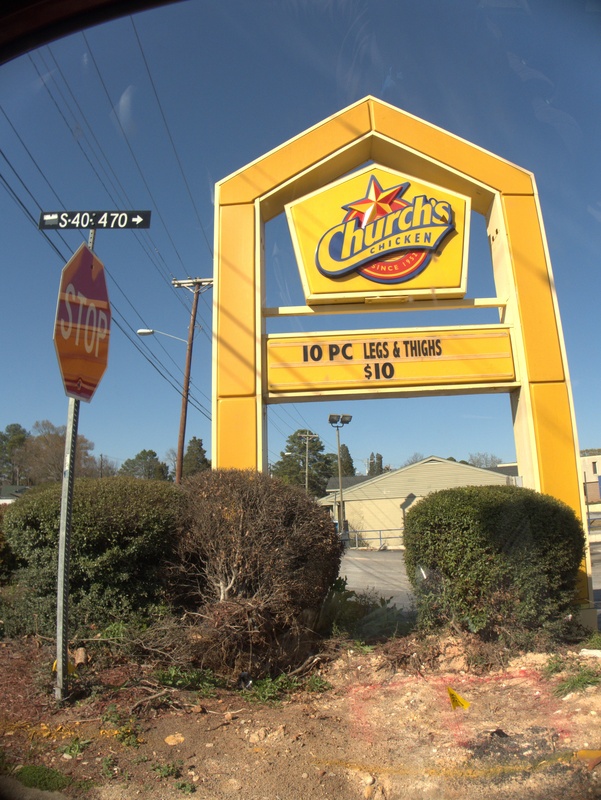 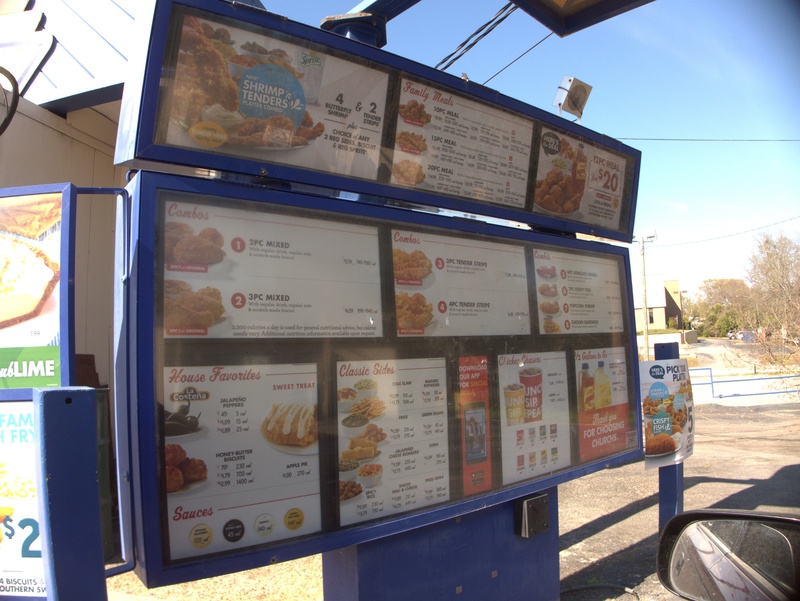 I think I've mentioned my aversion to feathered fare several times here, so it should be no surprise that I never darkened the door at this Church's Chicken more or less accross from the old Shoney's. I suppose for different reasons, not enough other people did either. 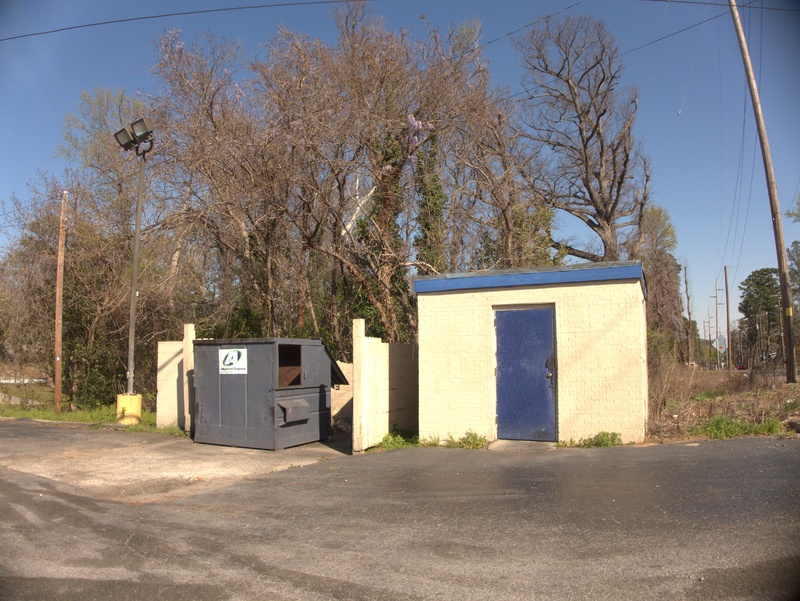 UPDATE 10 March 2017: Changed the closing date from "Late 2016" to early "2017" based on the comments. 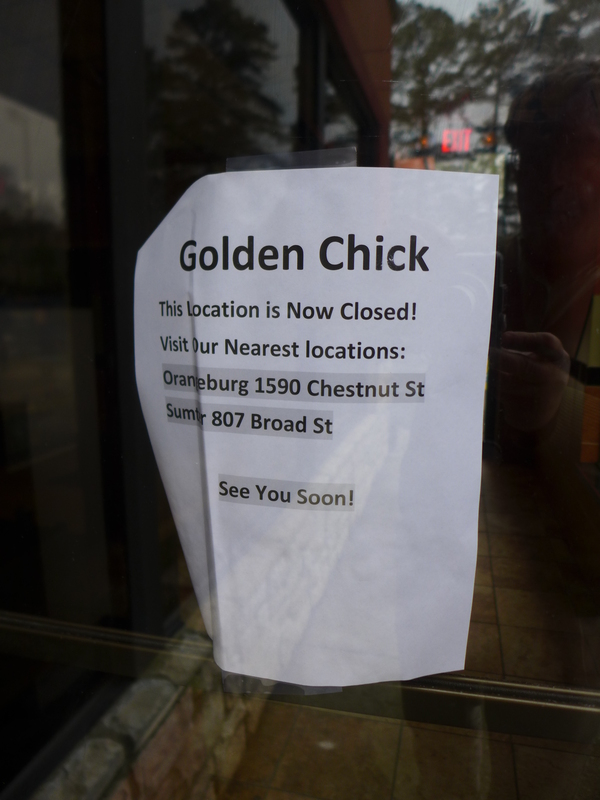 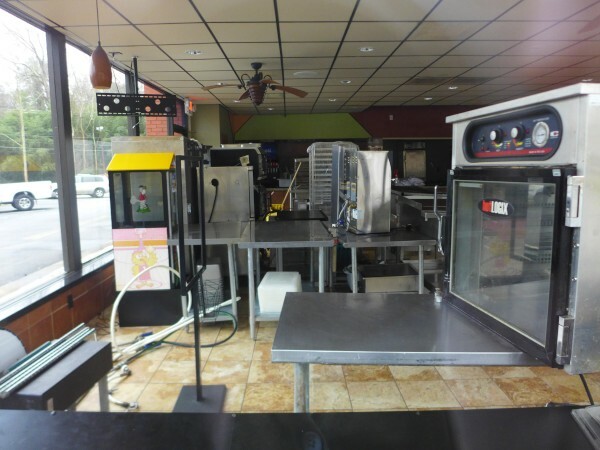 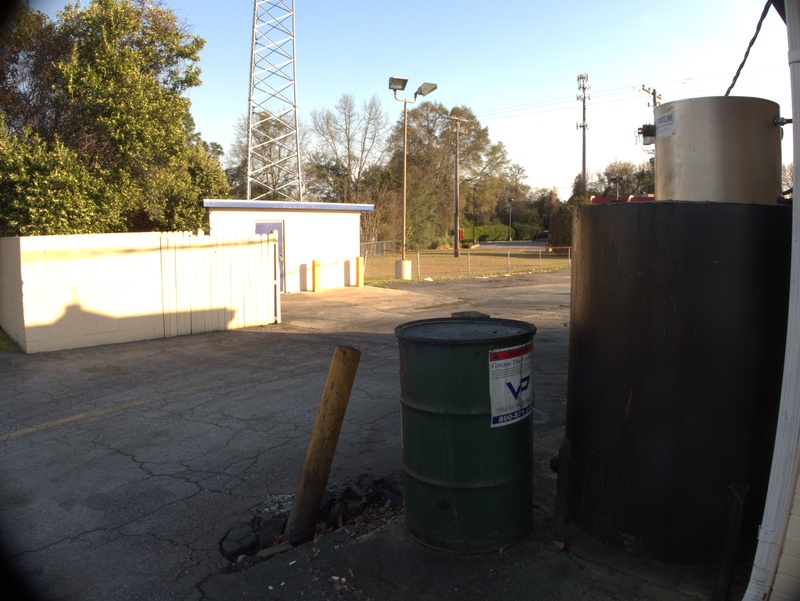 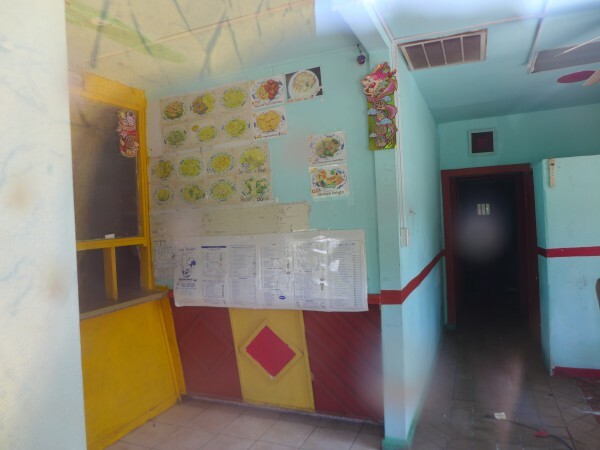 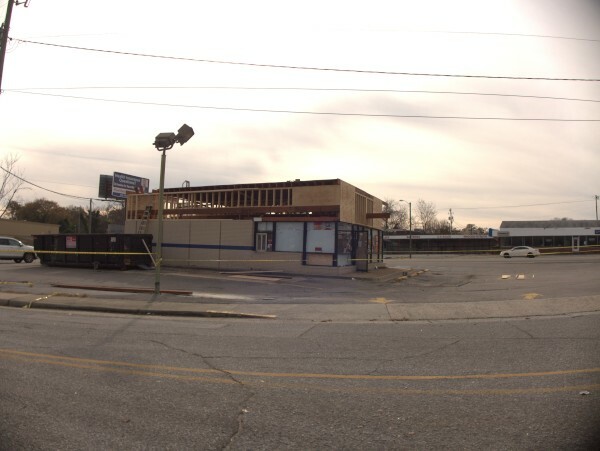 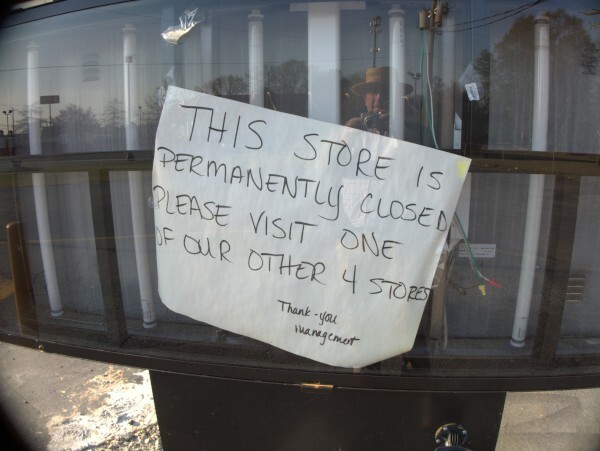 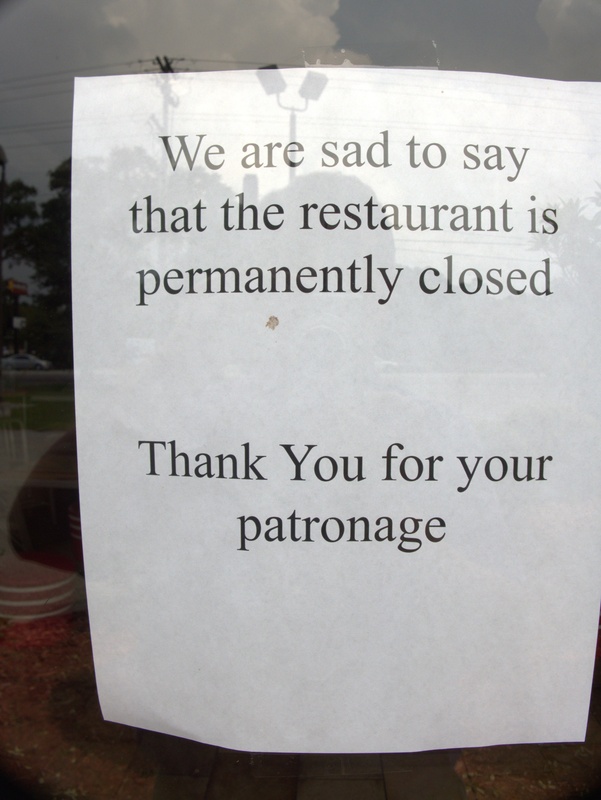 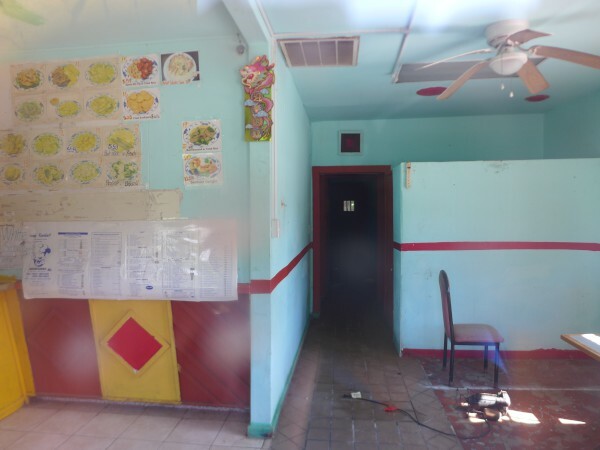 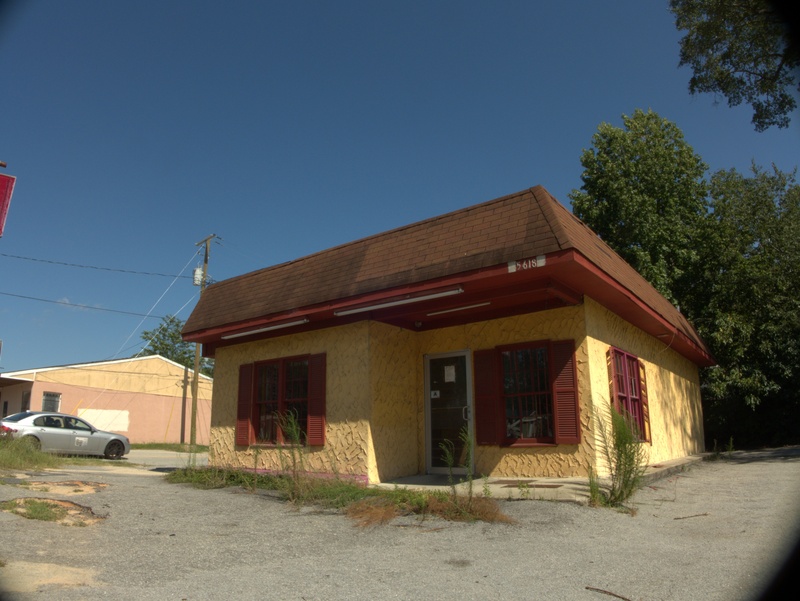 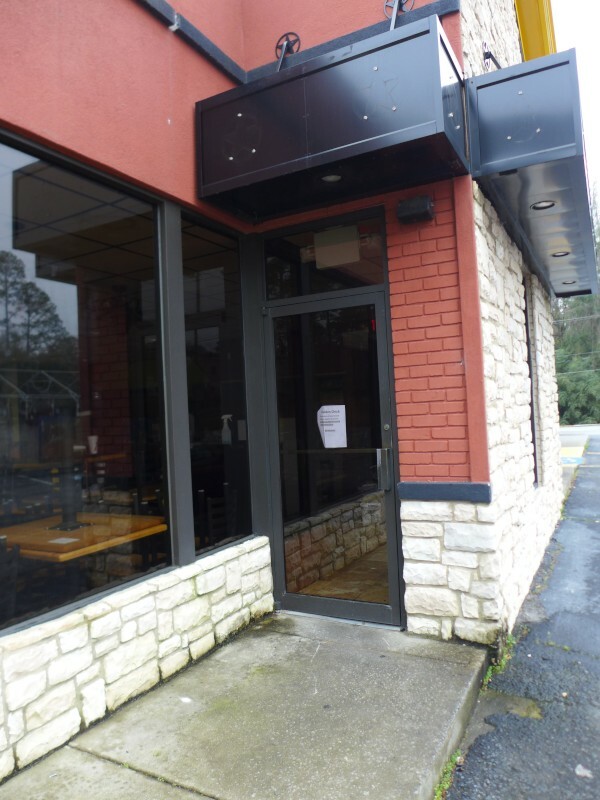 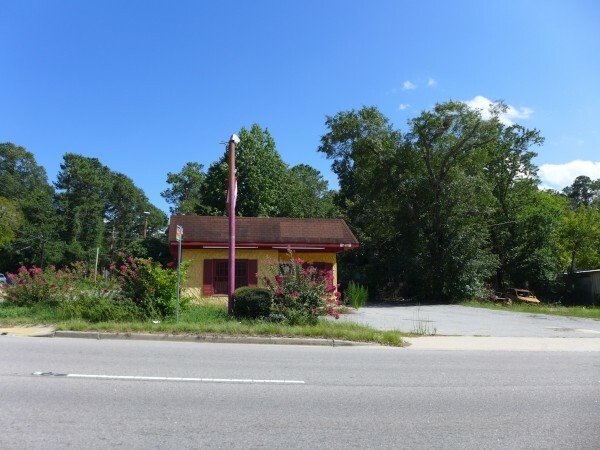 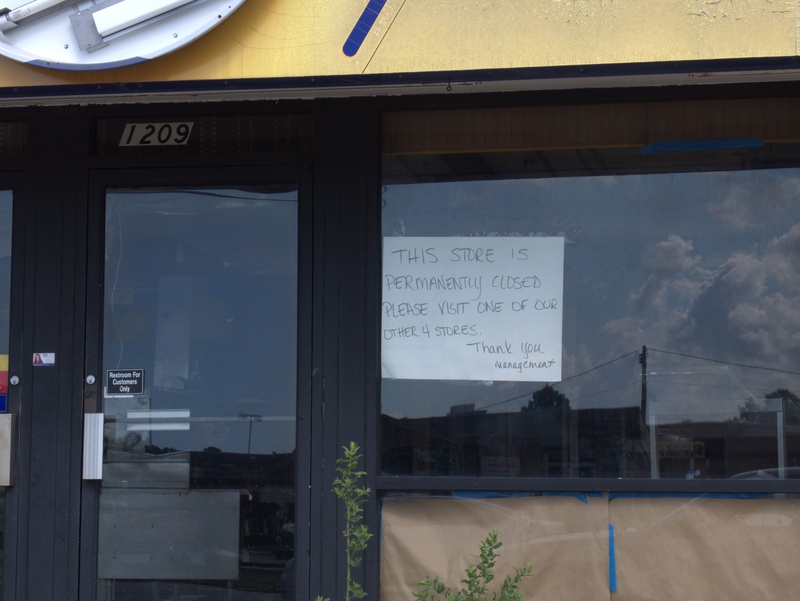 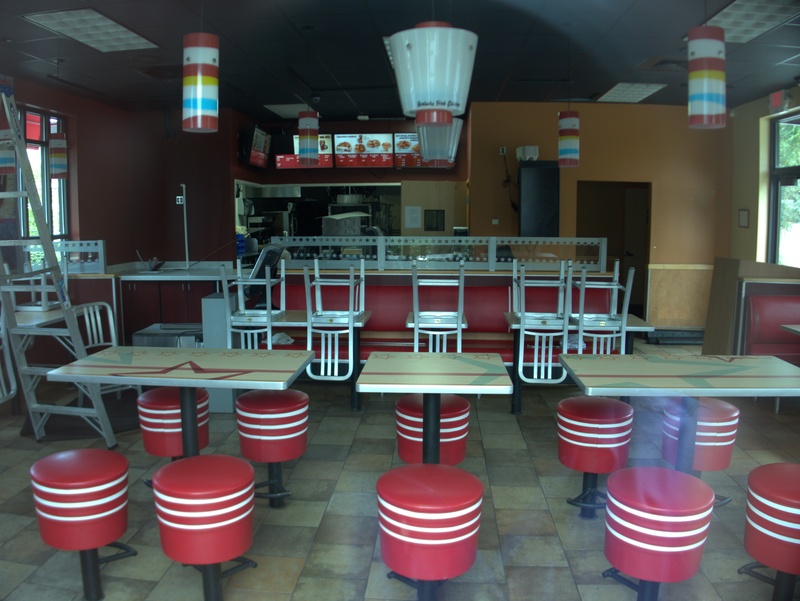 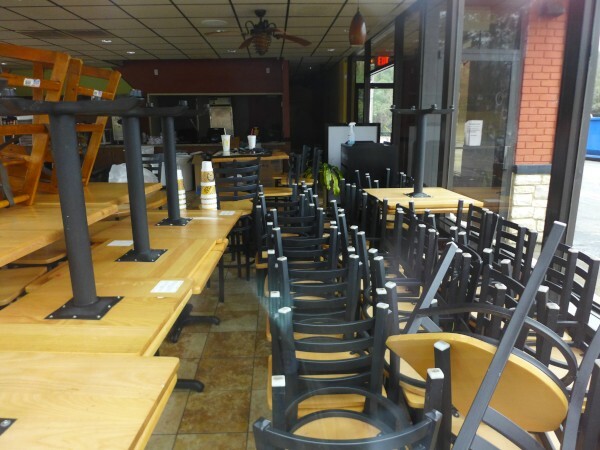 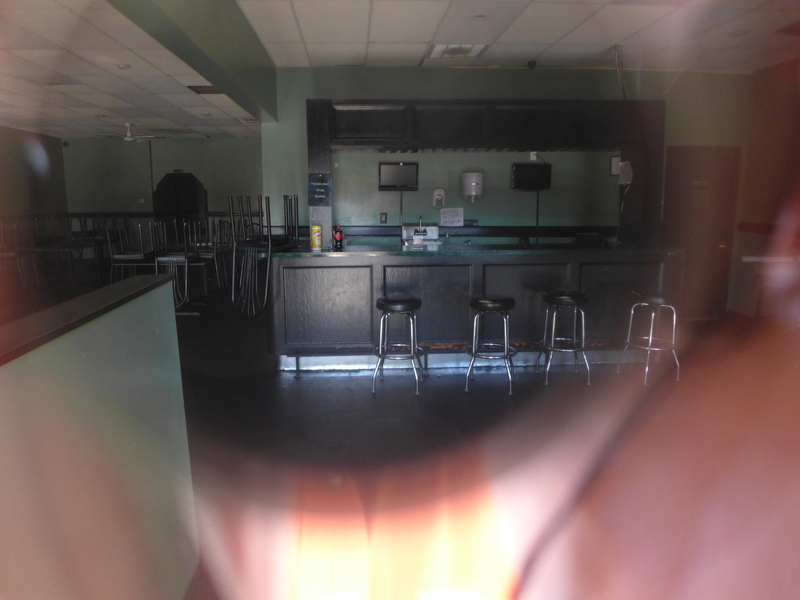 This little Chinese & Chicken outpost on North Main has been closed at least since March. 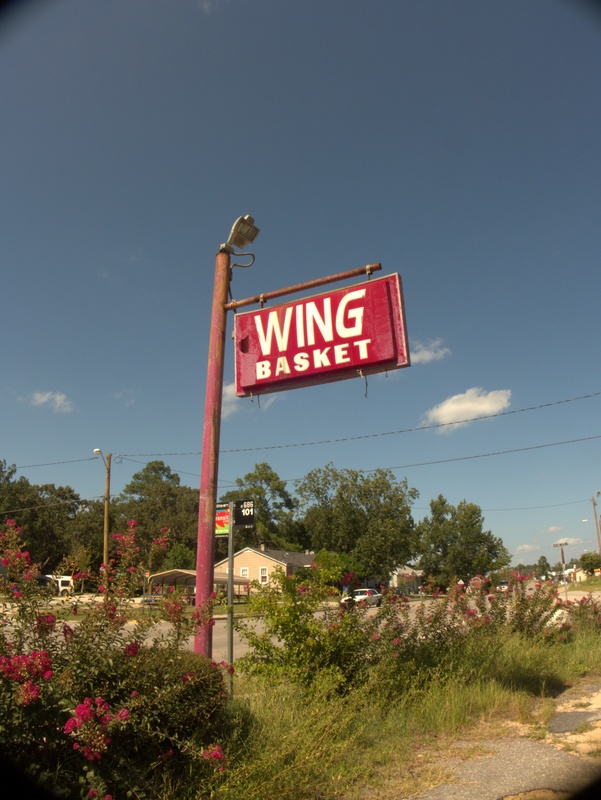 Wing Basket is obviously not the first tenant in this building, but the shape of it doesn't suggest anything concrete as to the original incarnation to me. 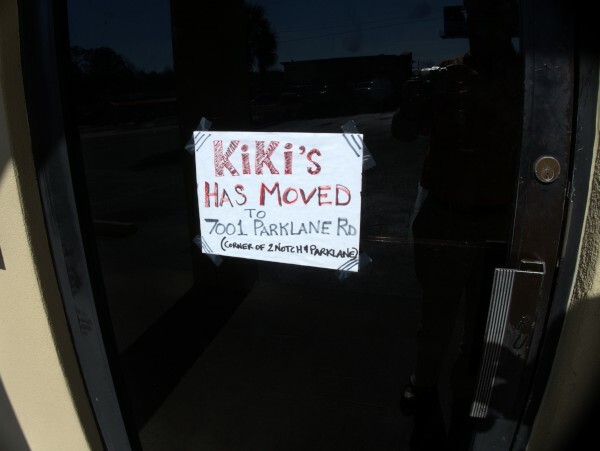 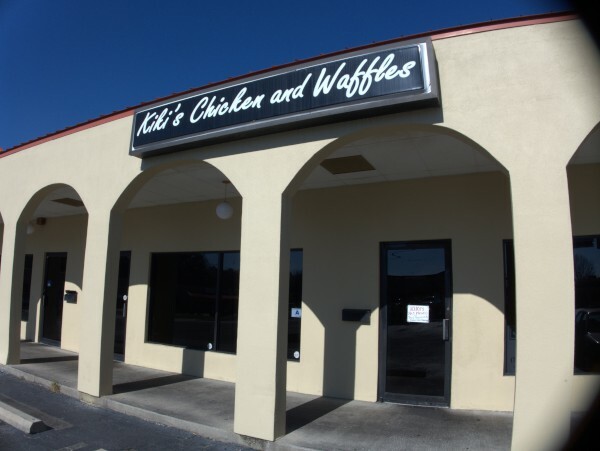 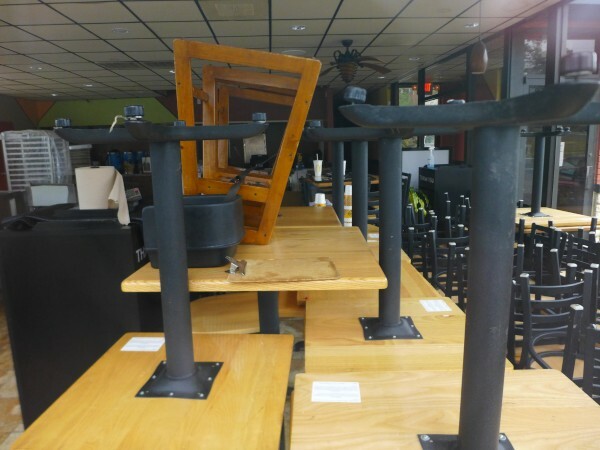 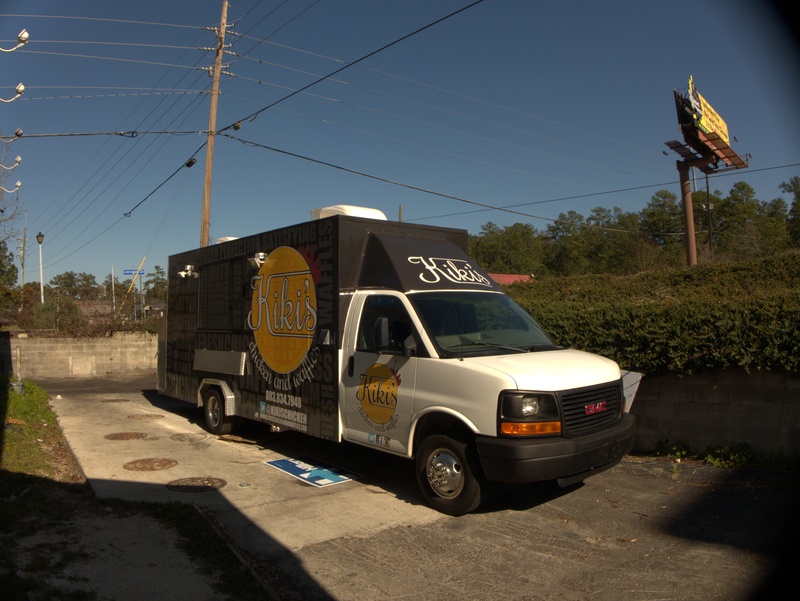 Soul food purveyors Kiki's Chicken & Waffles have left their old, cramped, digs in Fortune Square, and have moved into the old Sticky Fingers location at Columbia Mall. 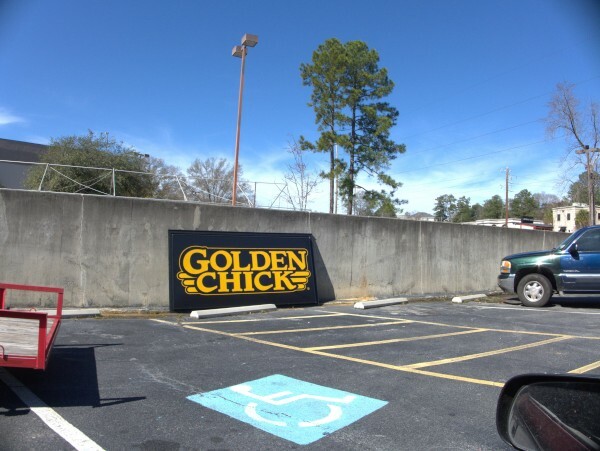 Judging from the parking lot Sunday 6 March, they will have no trouble filling the larger building.. 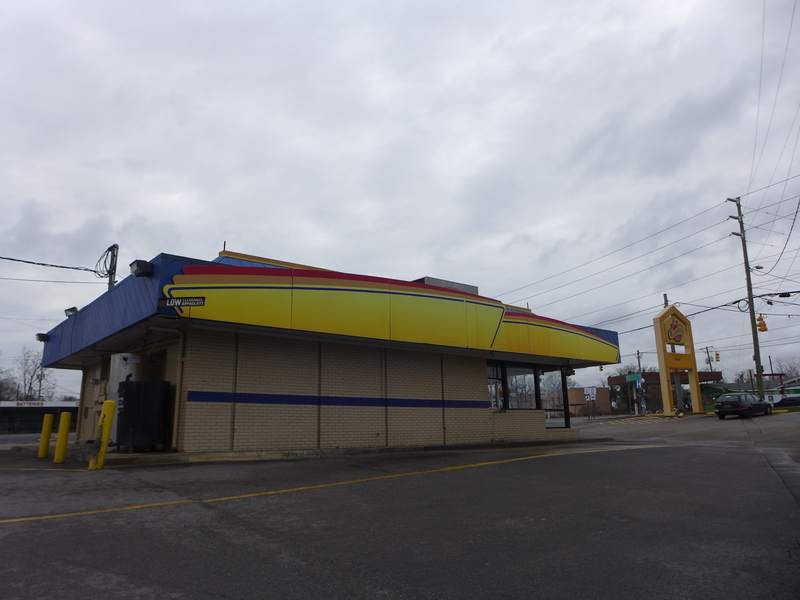 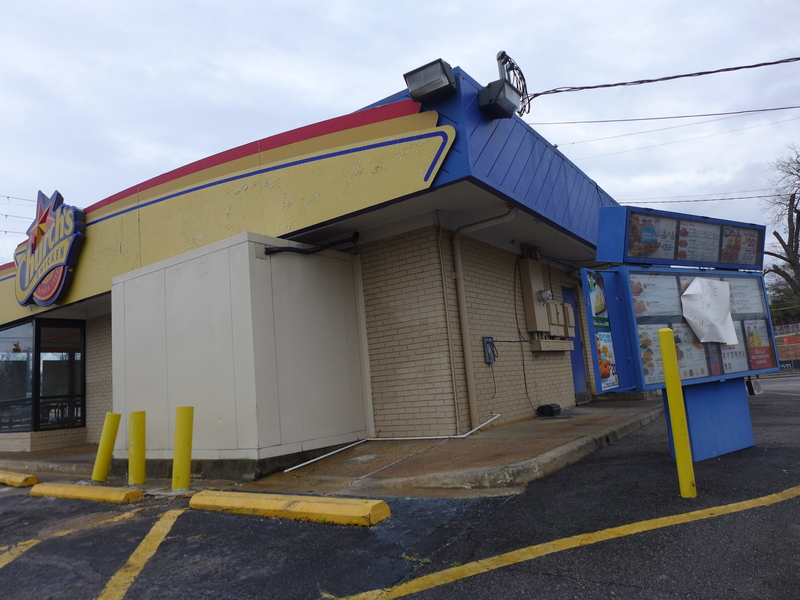 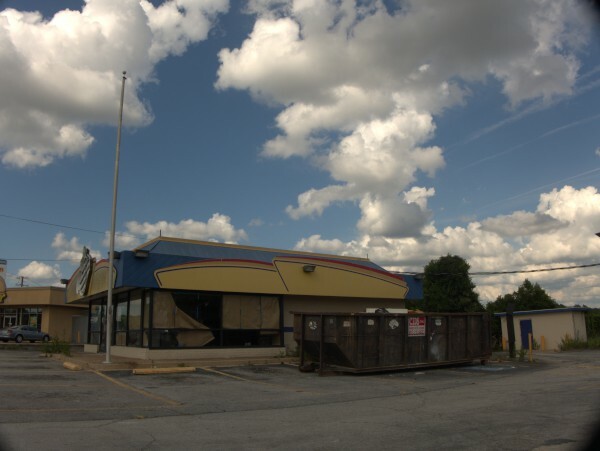 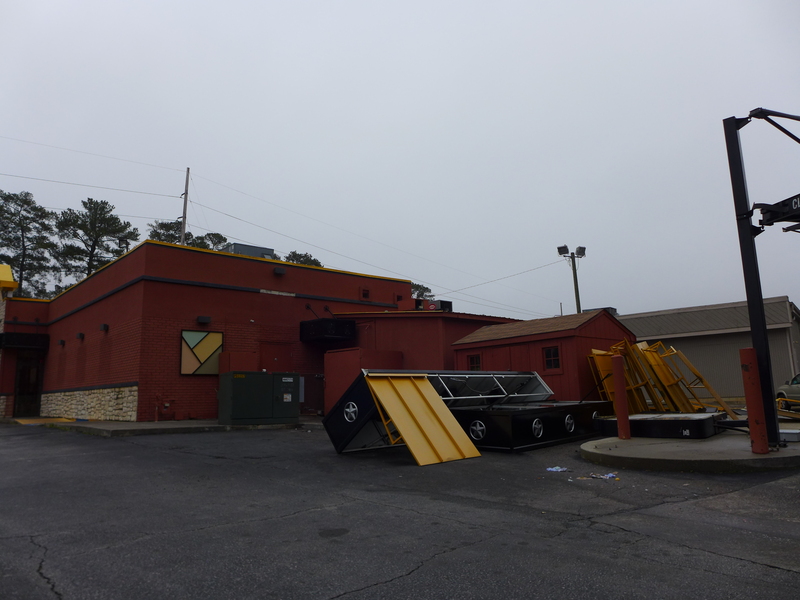 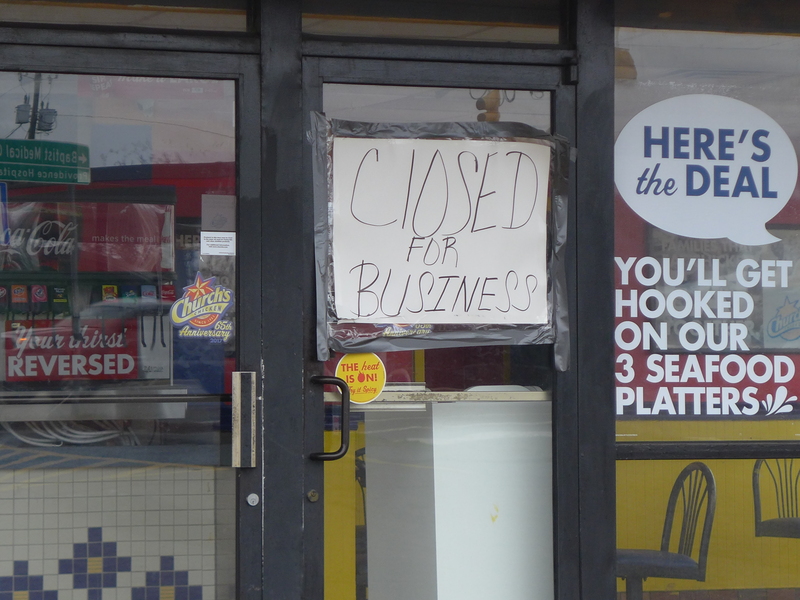 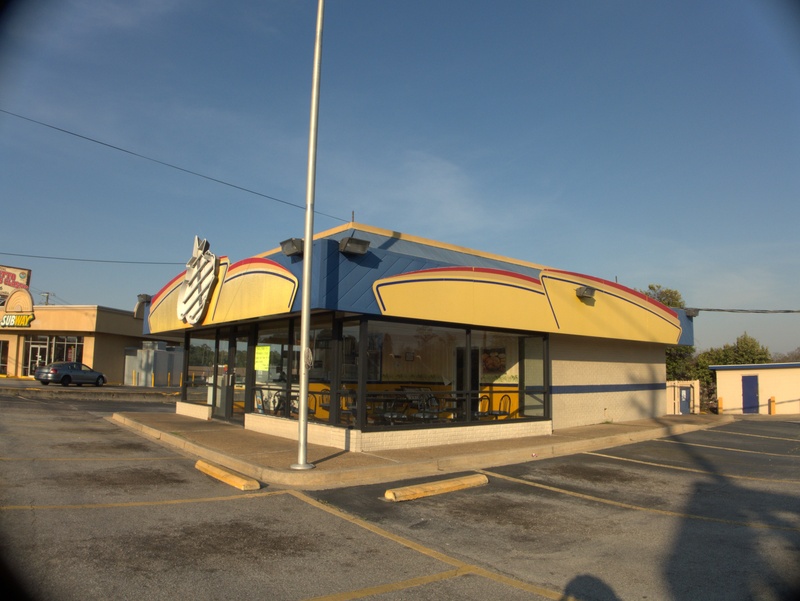 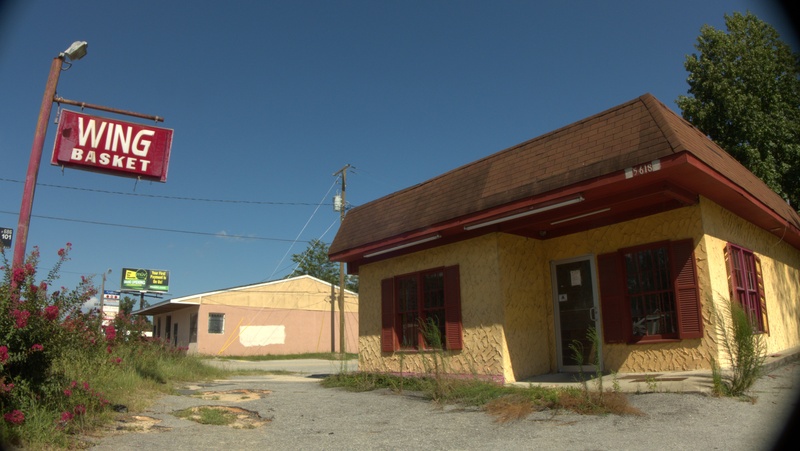 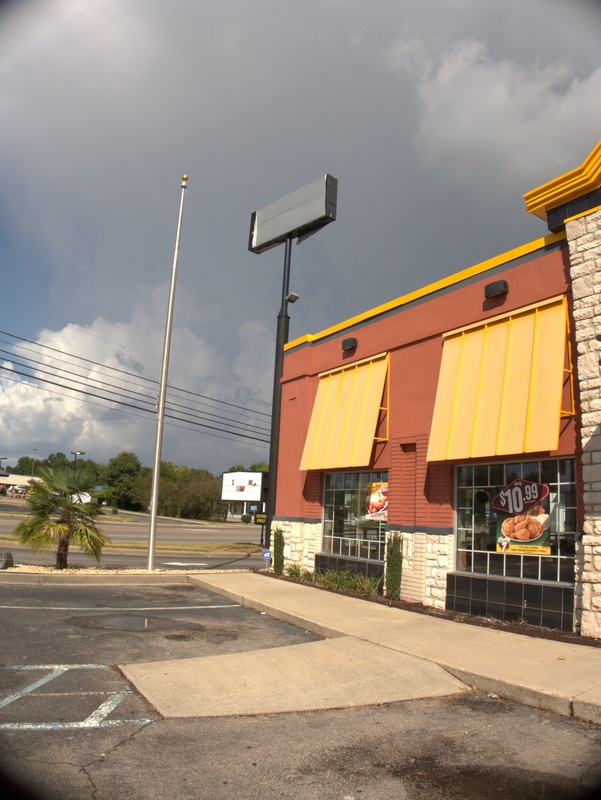 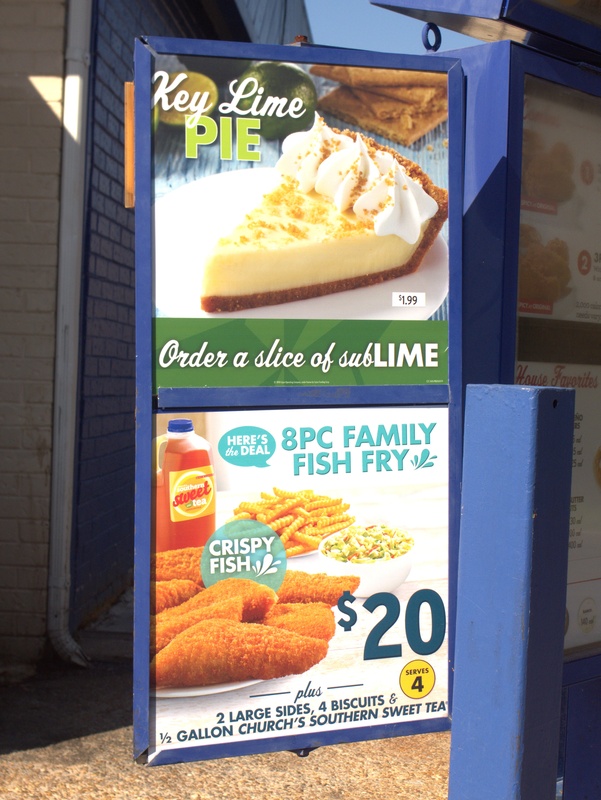 I don't really have a specific date for this closing, but I was down at the beach at the start of August, and am pretty sure I would have noticed if this KFC, next to the new Dollar General had been closed then as it was on Labor Day weekend. I'm a little surprised at this closing as it was a newly renovated store. 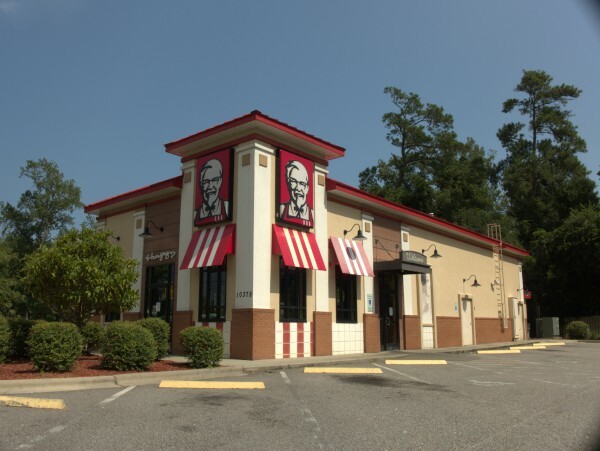 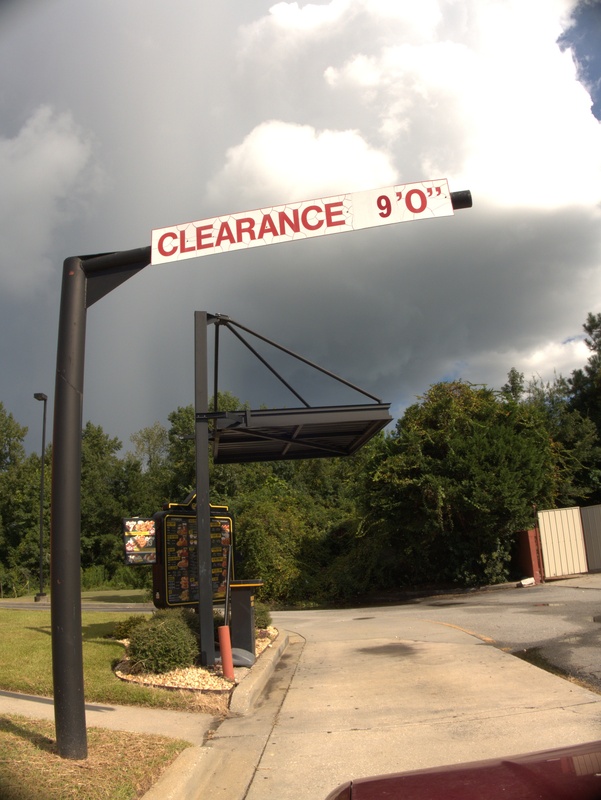 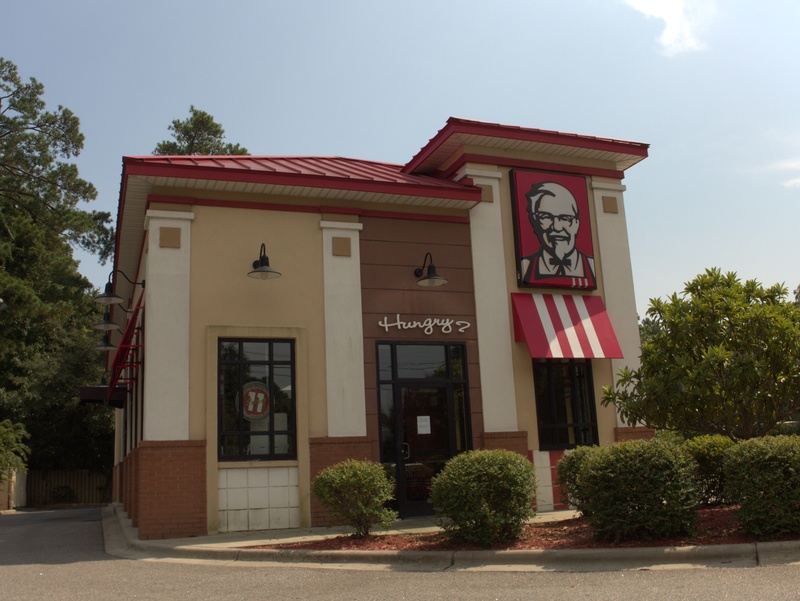 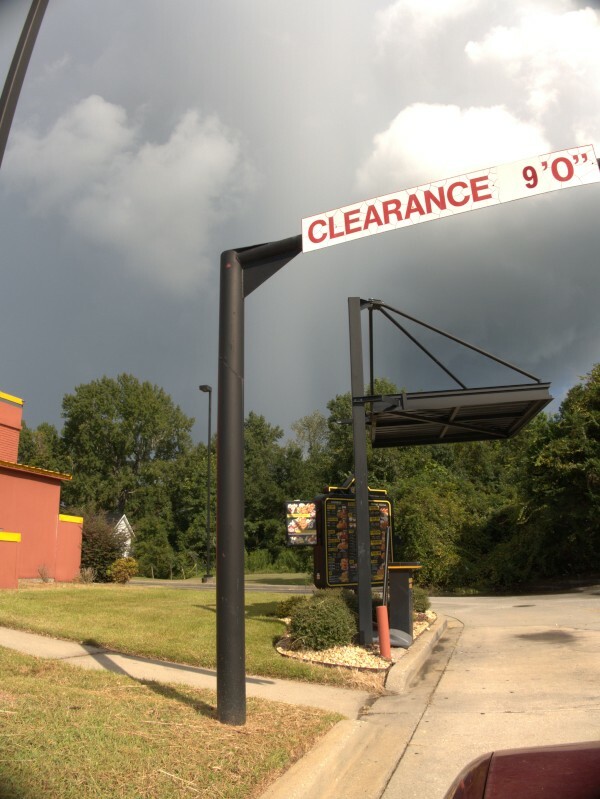 The original store, opened probably in the late 80s, was a "mini" KFC that did a mostly drive-through business, and when the time came that the chain wanted a full store, there were concerns whether they could manage it on the piece of property they had, given that the setback and spacing rules had just changed. 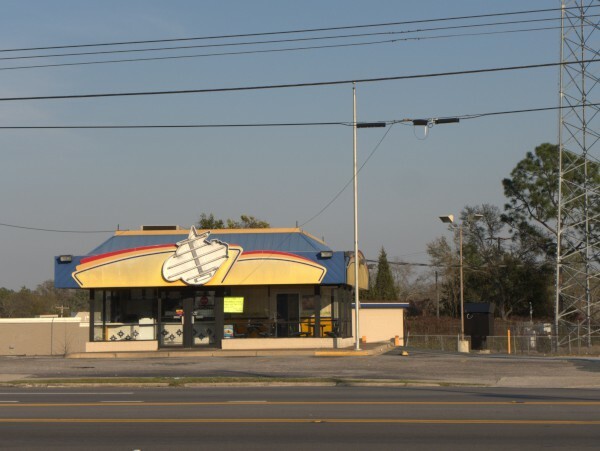 In the event they came up with the design you see here, which apparently satisfied all the agencies and seemed to do a good business for a number of years.